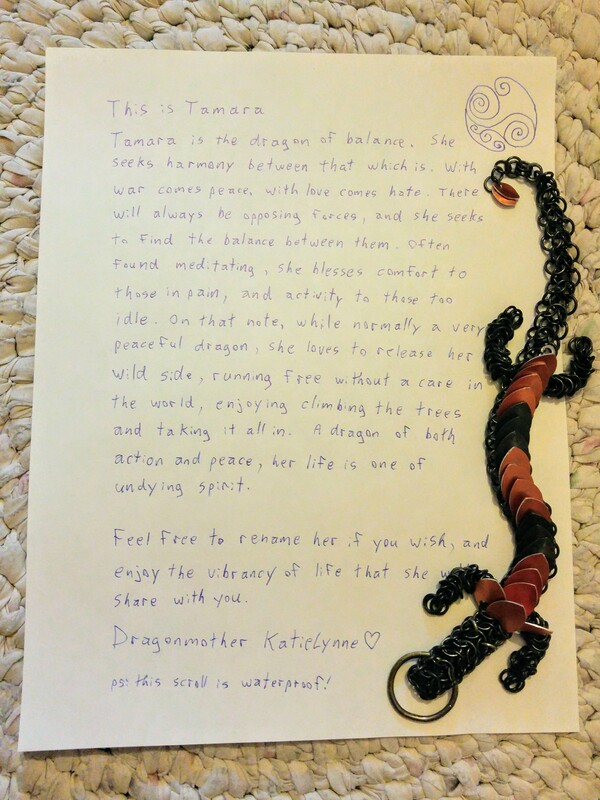 Tamara is the dragon of balance. She seeks harmony between that which is. With war comes peace, with love comes hate. There will always be opposing forces, and she seeks to find the balance between them. 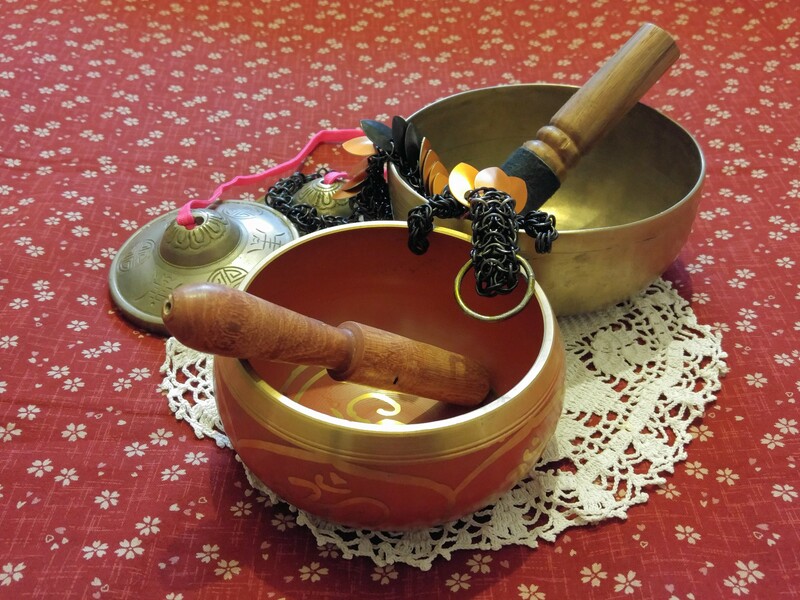 Often found meditating, she blesses comfort to those in pain, and activity to those too idle. On that note, while normally a very peaceful dragon, she loves to release her wild, untamed side, running free without a care in the world, enjoying climbing the trees and taking it all in. A dragon of both action and peace, her life is one of undying spirit. 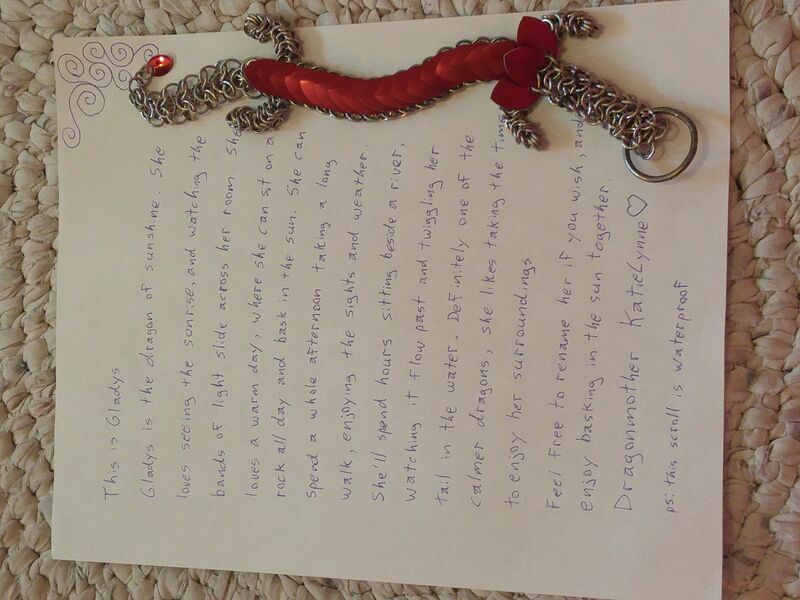 Gladys is the dragon of sunshine. She loves seeing the sunrise, and watching the bands of light slide across her room. She loves a warm day, where she can sit on a rock all day and bask in the sun. She can spend a whole afternoon taking a long walk, enjoying the sights and weather. She'll spend hours sitting beside a river, watching it flow past and twiggling her tail in the water. Definitely one of the calmer dragons, she likes taking the time to enjoy her surroundings. 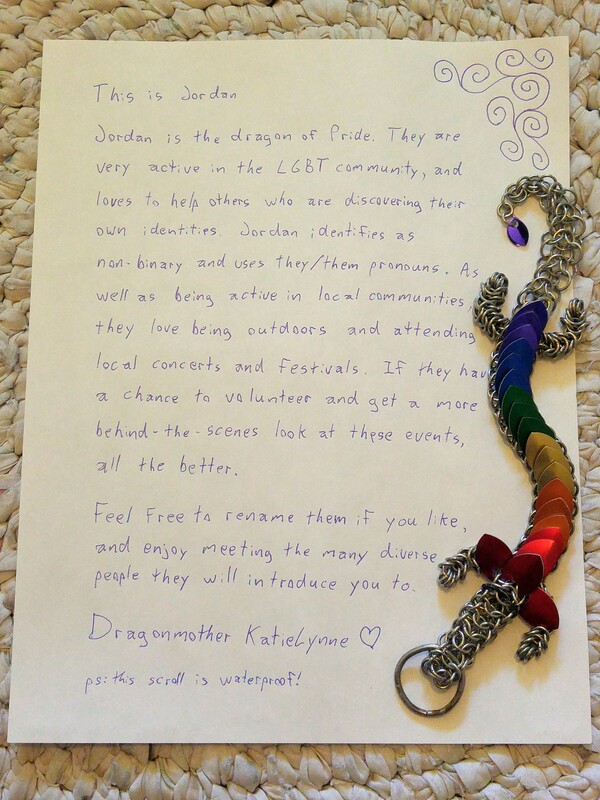 Jordan is the dragon of Pride. 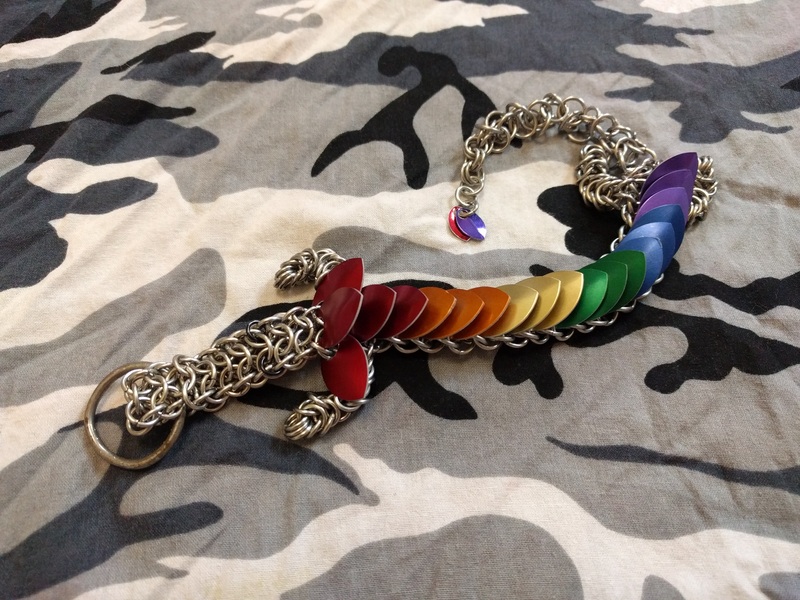 They are very active in the LGBT community, and loves to help others who are discovering their own identities. Jordan identifies as non-binary and uses they/them pronouns. As well as being active in local communities, they love being outdoors and attending local concerts and festivals. If they have a chance to volunteer to get a more behind-the-scenes look at these events, all the better. 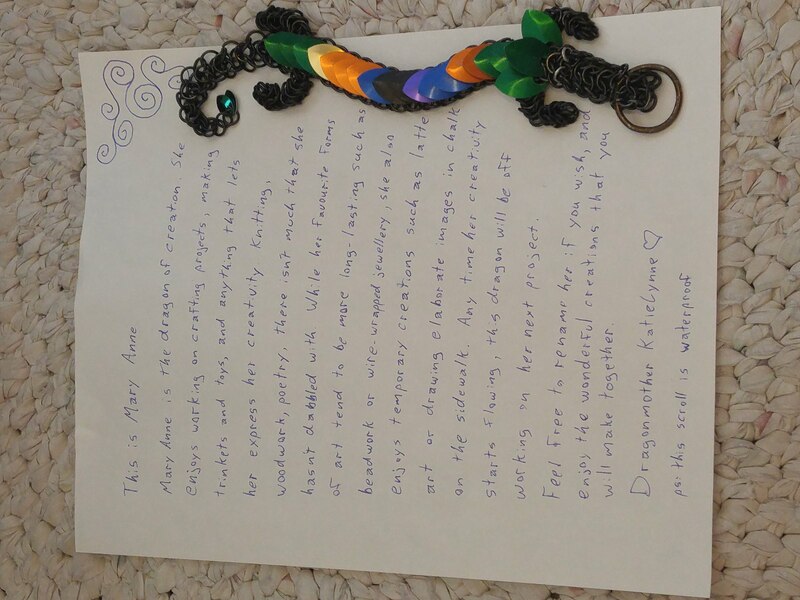 Mary Anne is the dragon of creation. 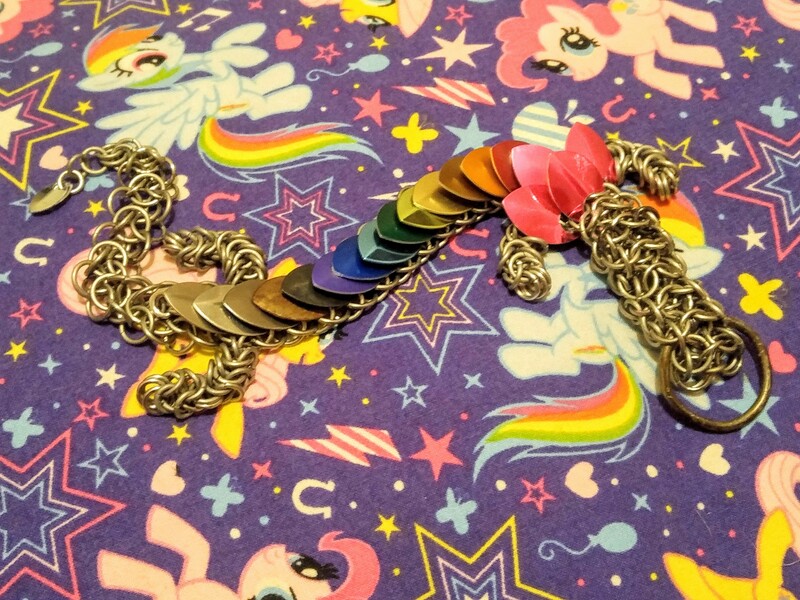 She enjoys working on crafting projects, making trinkets and toys, and anything that lets her express her creativity. 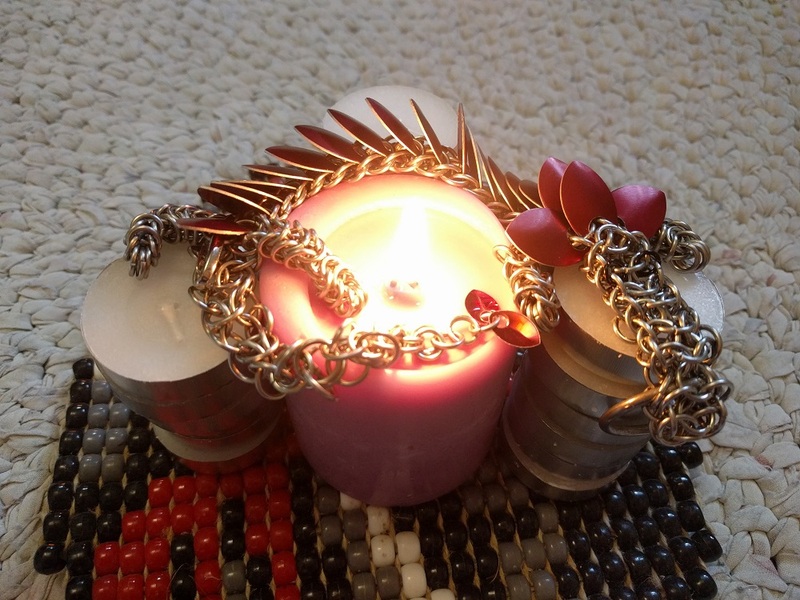 Knitting, woodwork, poetry, there isn't much that she hasn't dabbled with. While her favourite forms of art tend to be more long-lasting, such as beadwork or wire-wrapped jewellery, she also enjoys temporary creations such as making latte art, or drawing elaborate images in chalk on the sidewalk. 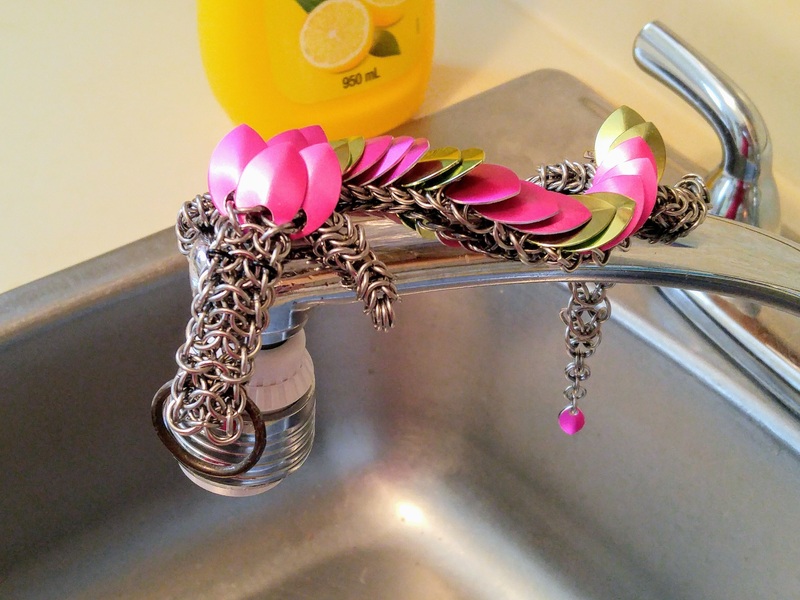 Any time her creativity starts flowing, this dragon will be off working on her next project. 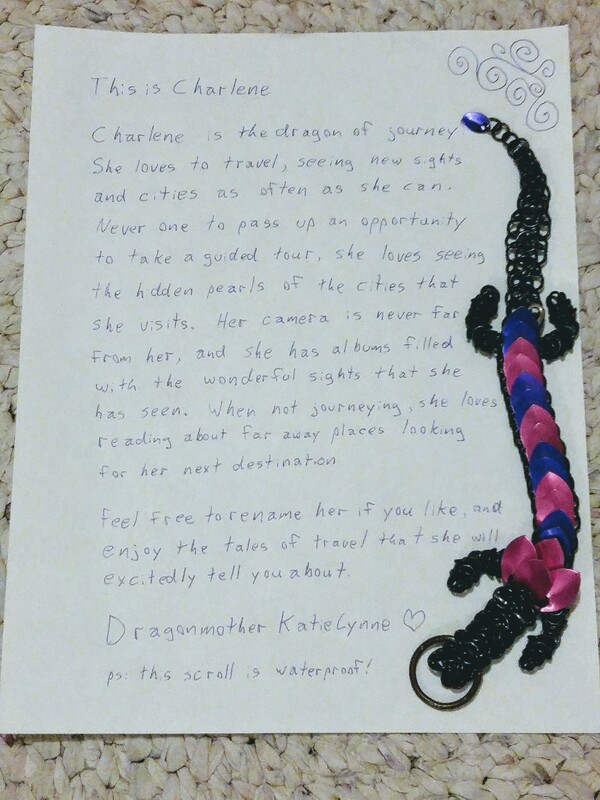 Charlene is the dragon of journey. 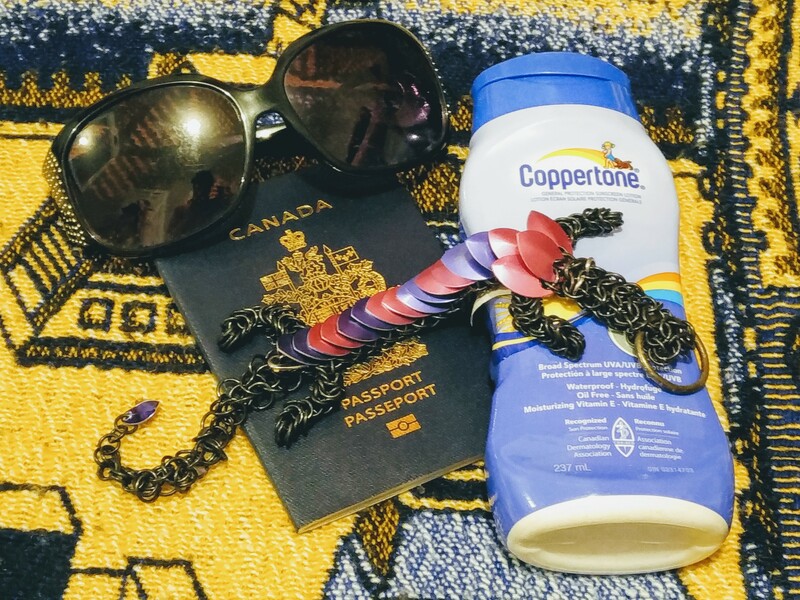 She loves to travel, seeing new sights and cities as often as she can. Never one to pass up an opportunity to take a guided tour, she loves seeing the hidden pearls of the cities that she visits. Her camera is never far from her, and she has albums filled with the wonderful sights that she has seen. When not journeying, she loves reading about far away places looking for her next destination. 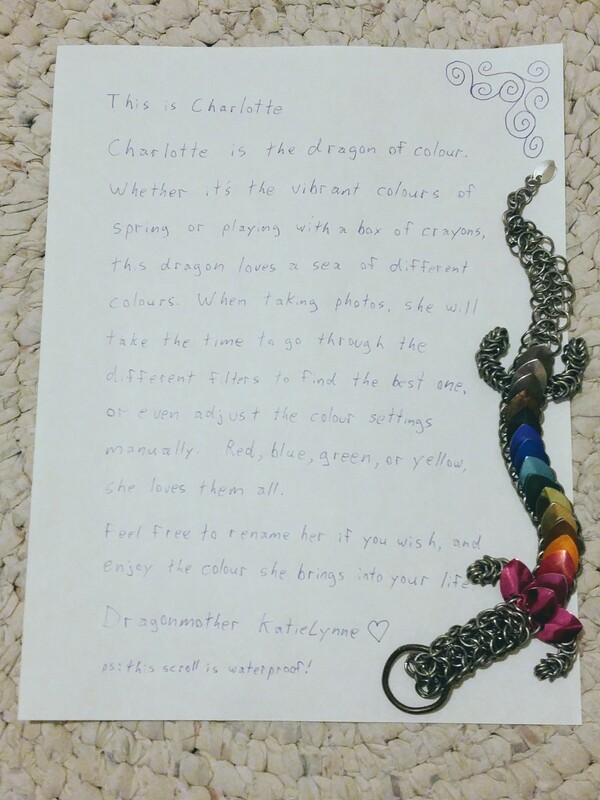 Charlotte is the dragon of colour. 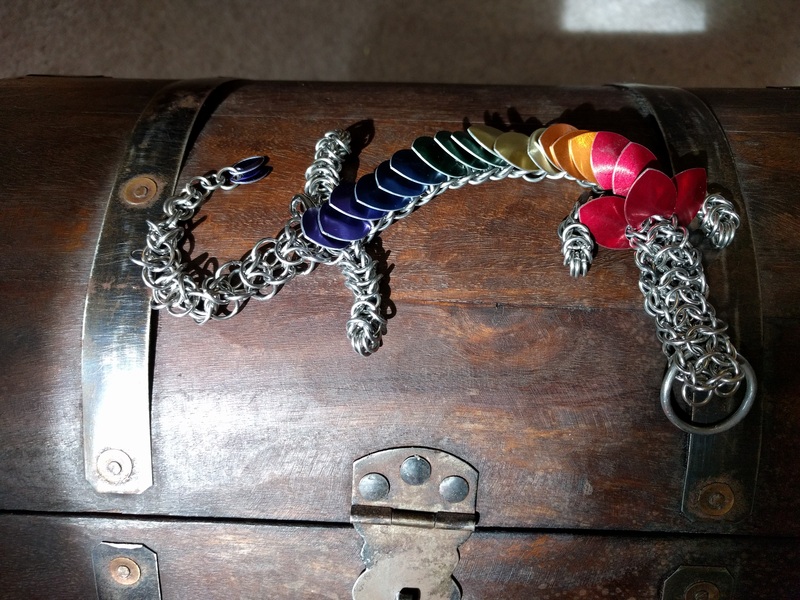 Whether it's the vibrant colours of spring or playing with a box of crayons, this dragon loves a sea of different colours. When taking photos, she will take the time to go through the different filters to find the best one, or even adjust the colour settings manually. Red, blue, green, or yellow, she loves them all. 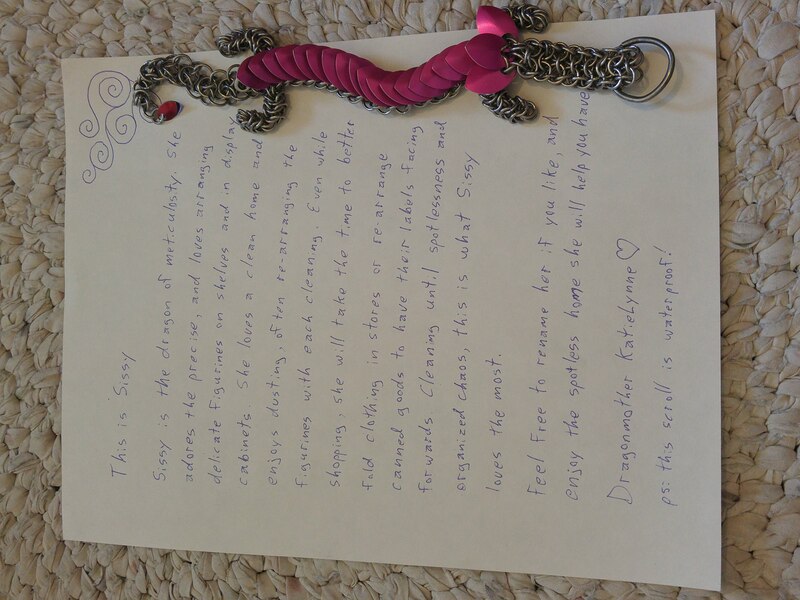 She is also my second personal dragon, as Octavia had gone missing for a time. 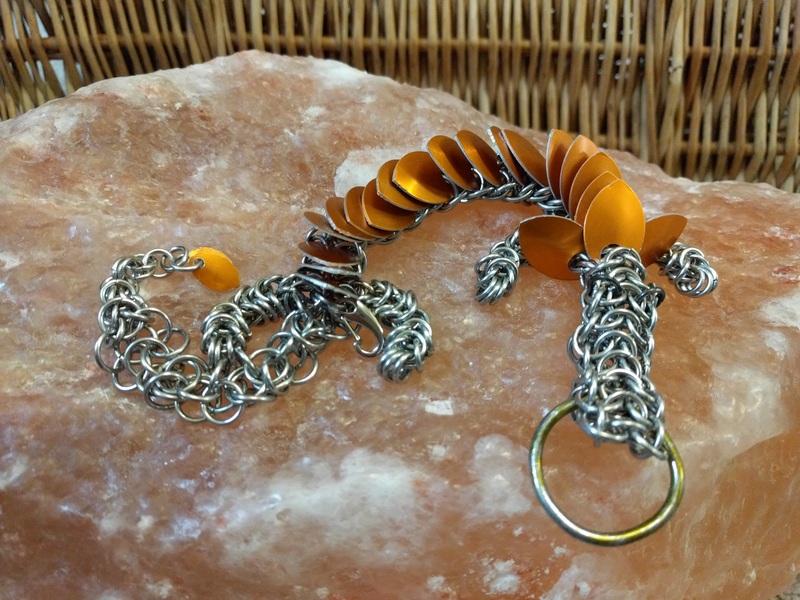 Charlotte is made from each of the scale colours that I had available, including a new 'rust scale', made by deliberately rusting mild steel! 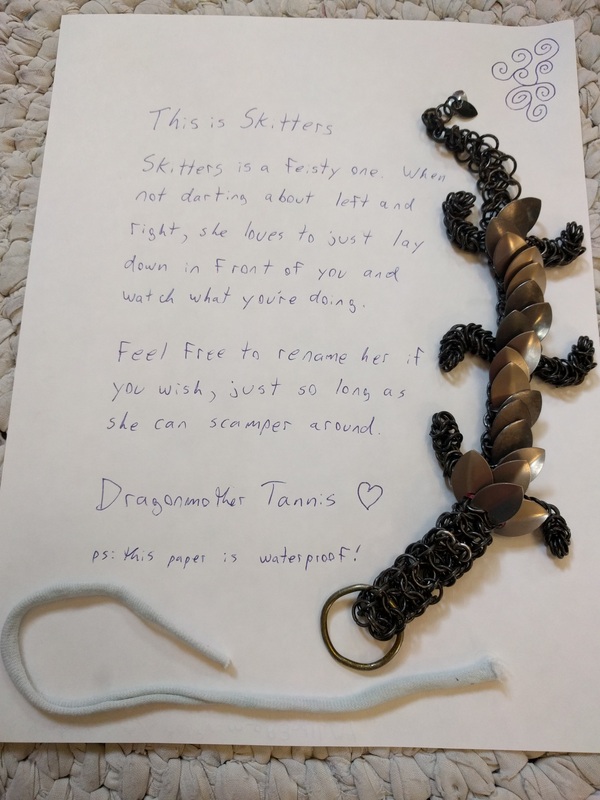 With a full titanium body, she's one of my lightest dragons. 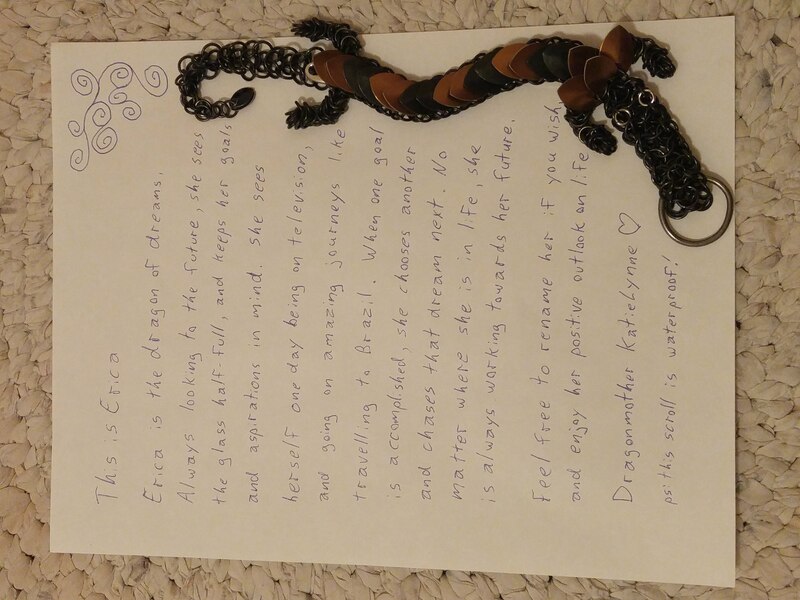 Erica is the dragon of dreams. Always looking to the future, she sees the glass half-full, and keeps her goals and aspirations in mind. She sees herself one day being on television, and going on amazing journeys like travelling to Brazil. When one goal is accomplished, she chooses another and chases that dream next. No matter where she is in life, she is always working towards her future. She is part Midnight, as due to time constraints, I needed to finish her, and Midnight had offered parts of herself to complete Erica for the new parent. 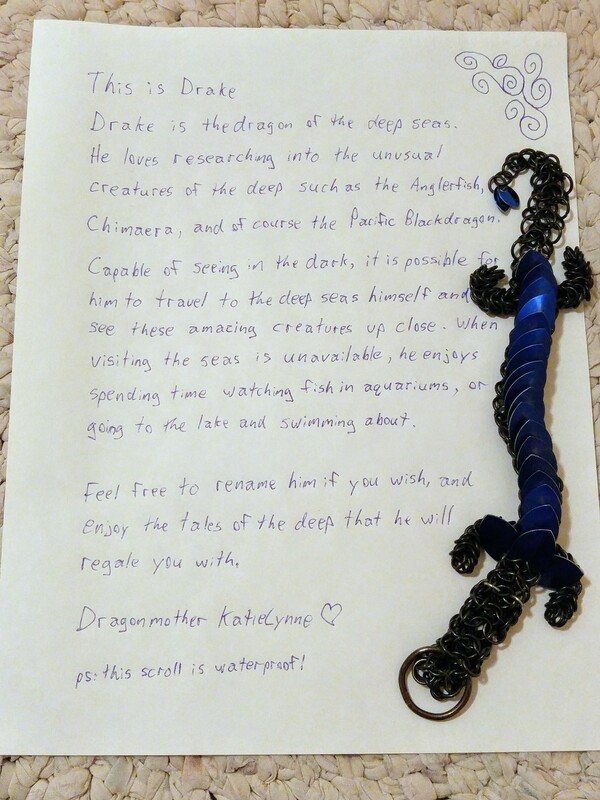 Drake is the dragon of the deep seas. 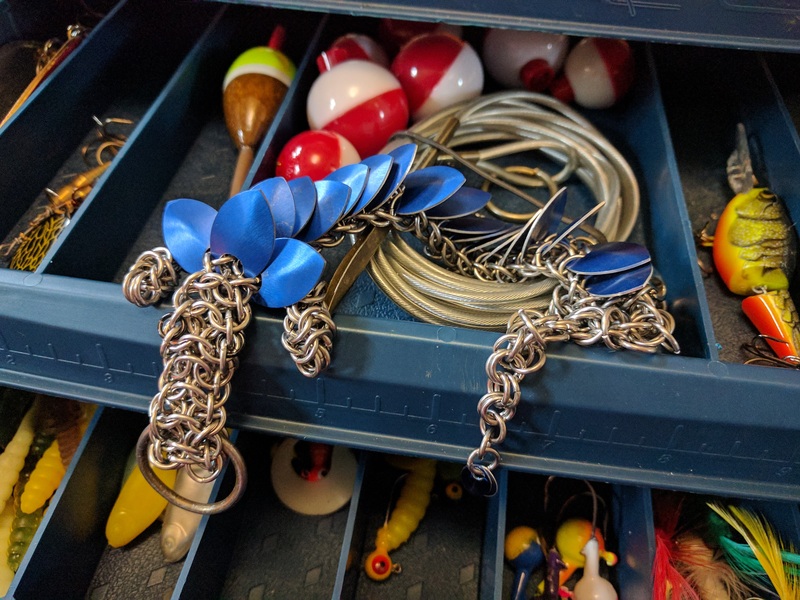 He loves researching into the unusual creatures of the deep such as the Anglerfish, Chimaera, and of course the Pacific Blackdragon. Capable of seeing in the dark, it is possible for him to travel to the deep seas himself and see these amazing creatures up close. When visiting the seas is unavailable, he enjoys spending time watching fish in aquariums, or going to the lake and swimming about. 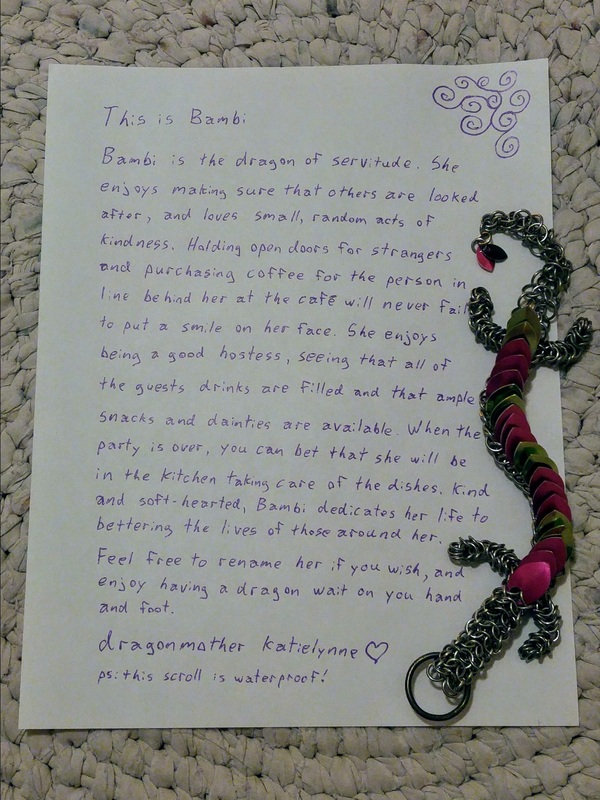 Bambi is the dragon of servitude. She enjoys making sure that others are looked after, and loves small, random acts of kindness. Holding open doors for strangers, and purchasing coffee for the person in line behind her at the café will never fail to put a smile on her face. 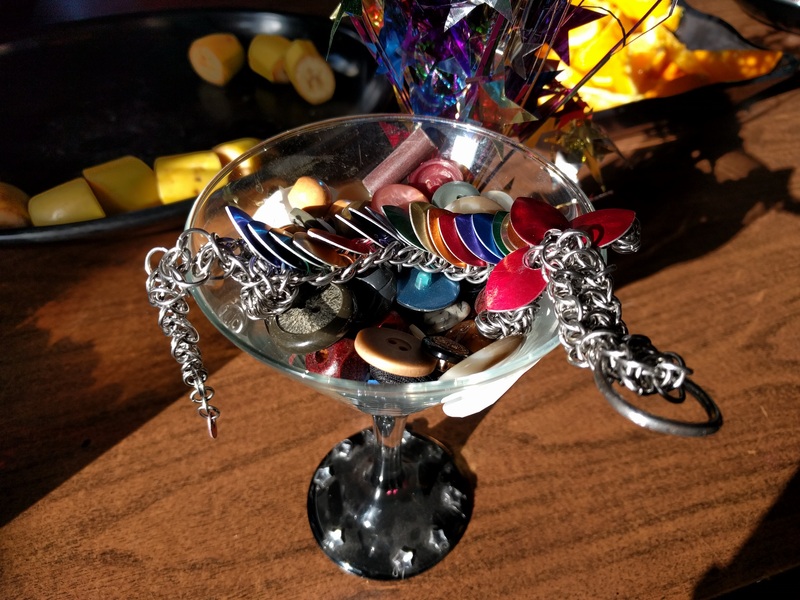 She enjoys being a good hostess, seeing that all of the guests' drinks are filled and that ample snacks and dainties are available. When the party is over, you can bet that she will be in the kitchen taking care of the dishes. Kind and soft-hearted, Bambi dedicates her life to bettering the lives of those around her. 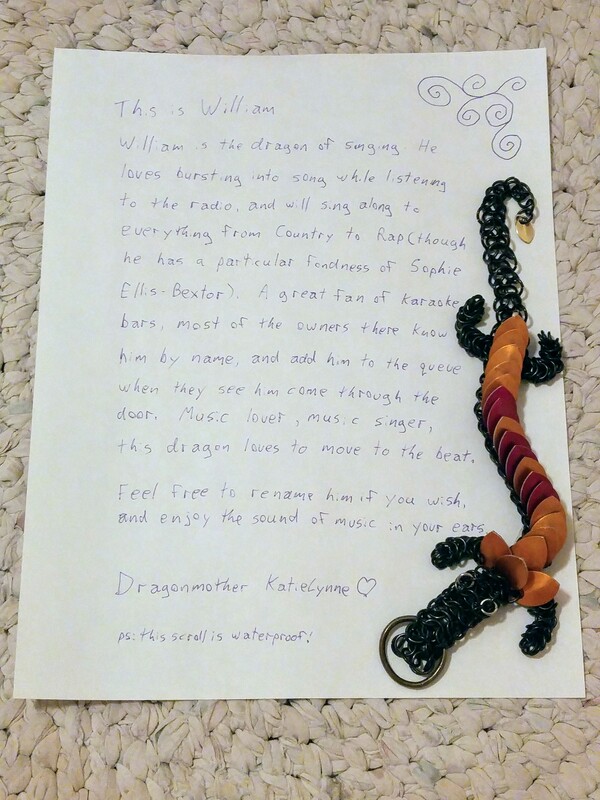 William is the dragon of singing. 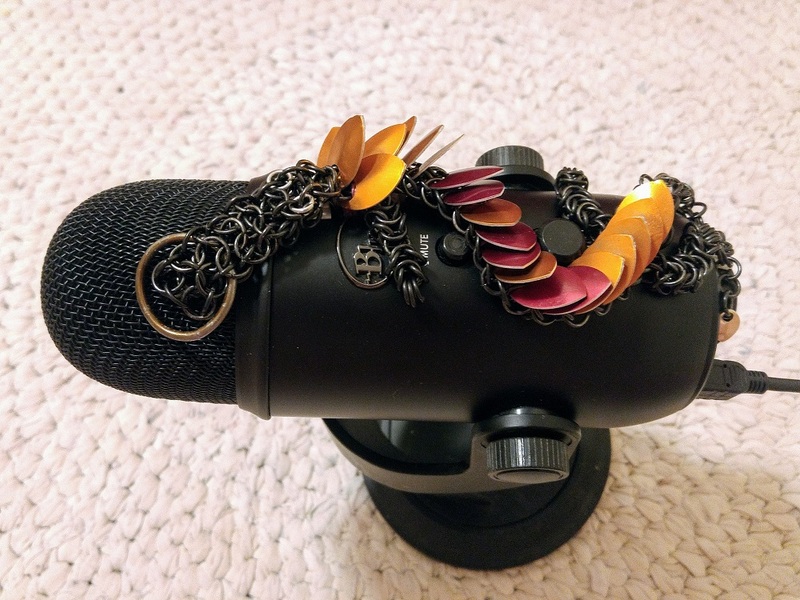 He loves bursting into song while listening to the radio, and will sing along to everything from Country to Rap (though he has a particular fondness for Sophie Ellis-Bextor). A great fan of karaoke bars, most of the owners know him by name, and add him to the queue when they see him come through the door. 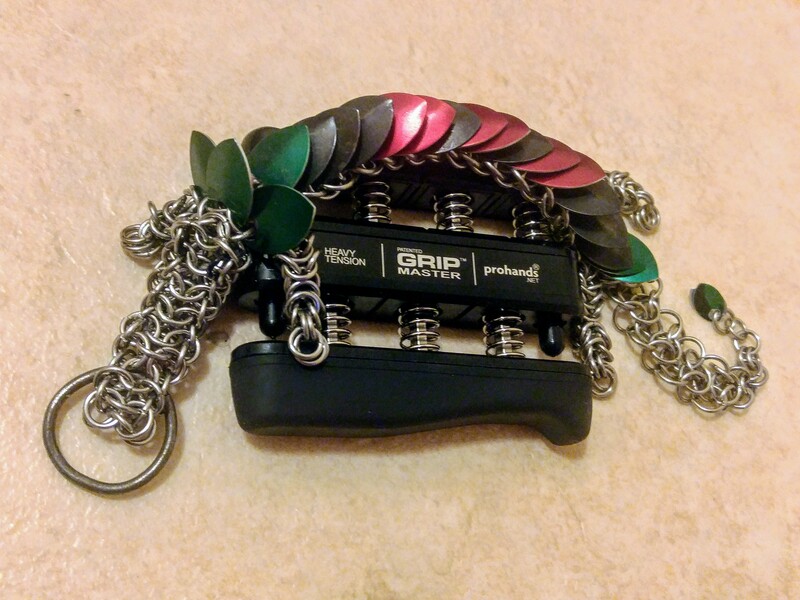 Music lover, music singer, this dragon loves to move to the beat. 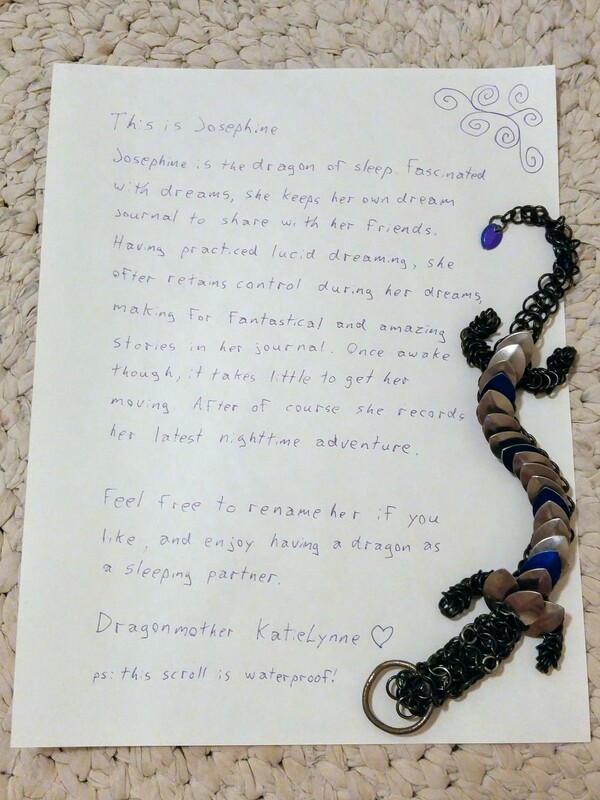 Josephine is the dragon of sleep. Fascinated with dreams, she keeps her own dream journal to share with her friends. Having practiced lucid dreaming, she often retains control during her dreams, making for fantastical and amazing stories in her journal. Once awake though, it takes little to get her moving. After of course she records her latest nighttime adventure. 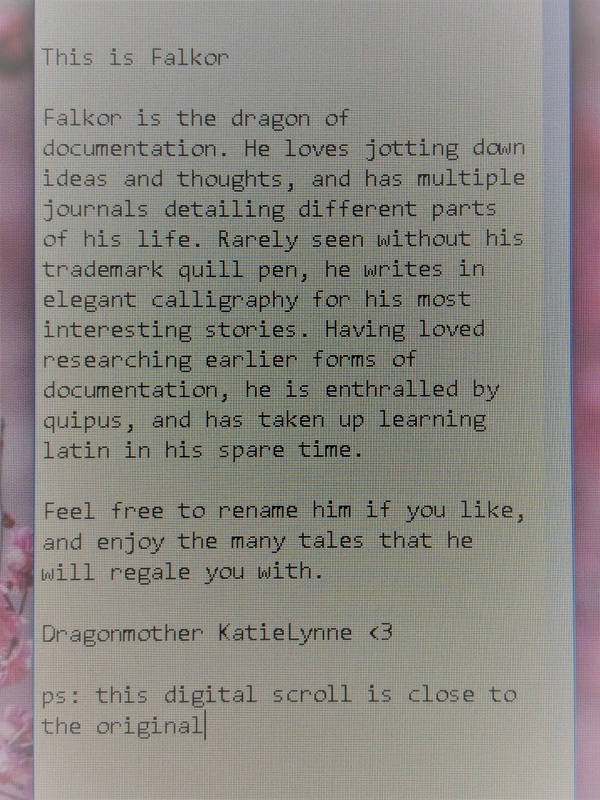 Falkor is the dragon of documentation. He loves jotting down ideas and thoughts, and has multiple journals detailing different parts of his life. Rarely seen without his trademark quill pen, he writes in elegant calligraphy for his most interesting stories. Having loved researching earlier forms of documentation, he is enthralled by quipus, and has taken up learning latin in his spare time. 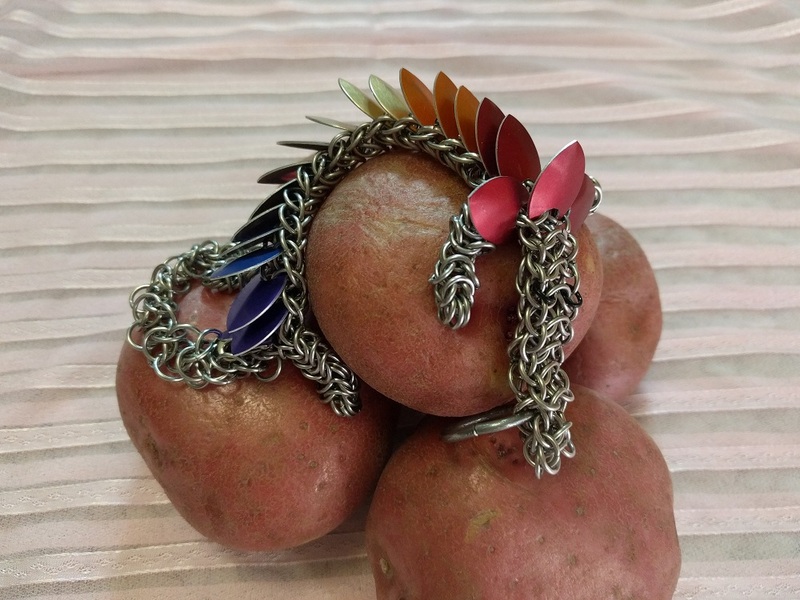 Jim has always been a fan of the still rings. 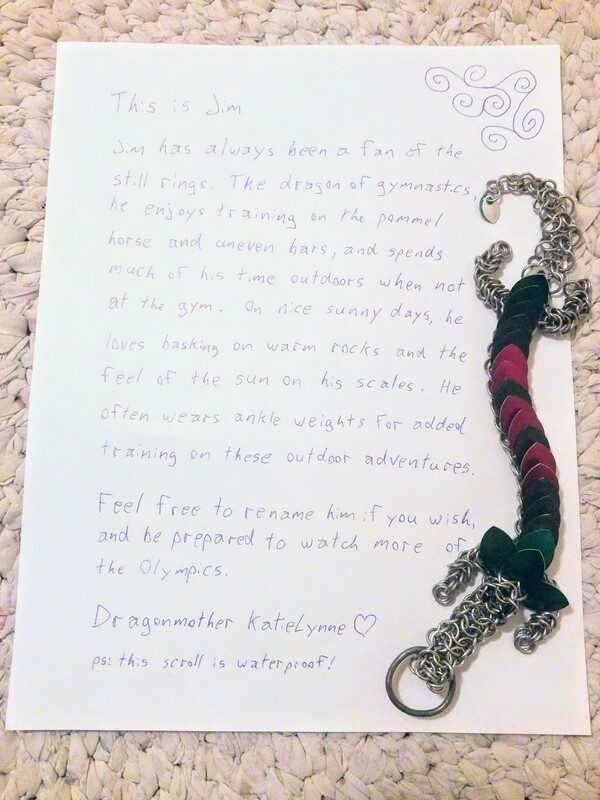 The dragon of gymnastics, he enjoys training on the pommel horse and uneven bars, and spends much of his time outdoors when not at the gym. 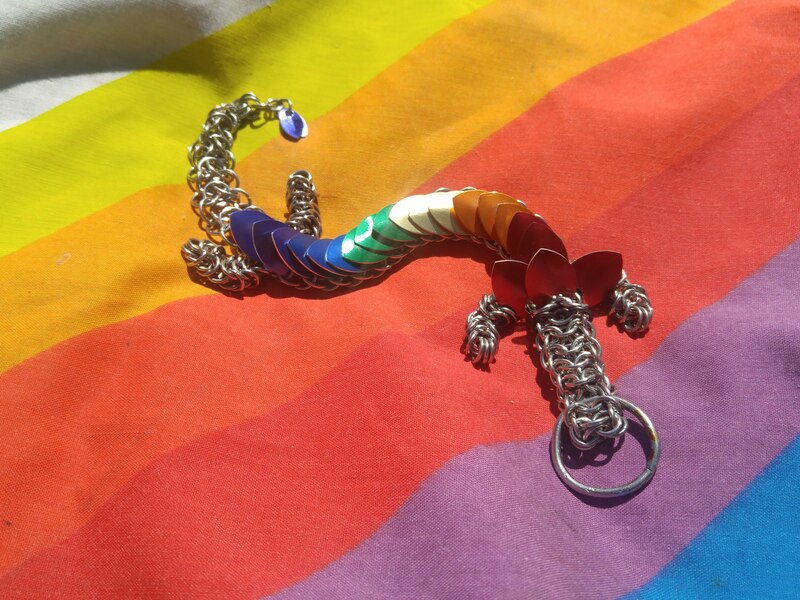 On nice sunny days, he loves basking on warm rocks and the feel of the sun on his scales. He often wears ankle weights for added training on these outdoor adventures. 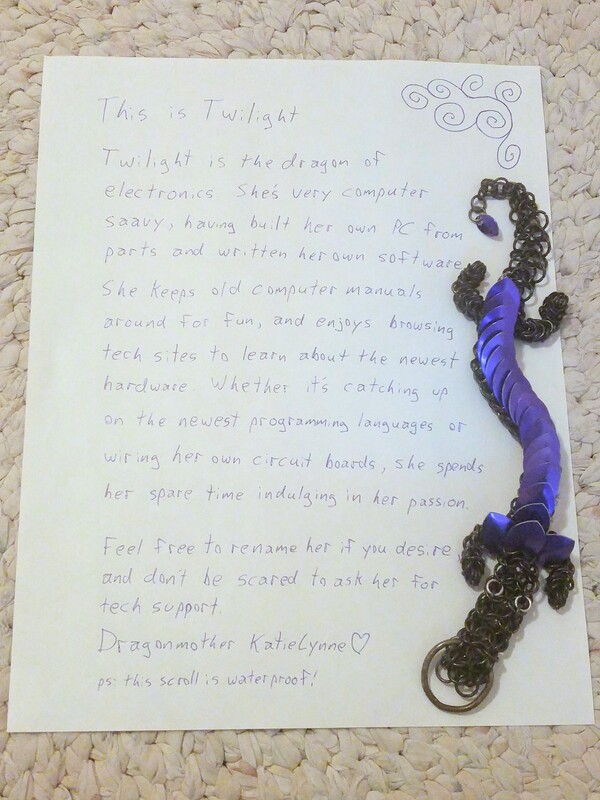 Twilight is the dragon of electronics. She's very computer saavy, having built her own PC from parts and written her own software (and still enjoys dabbling in QBasic when she gets the chance). 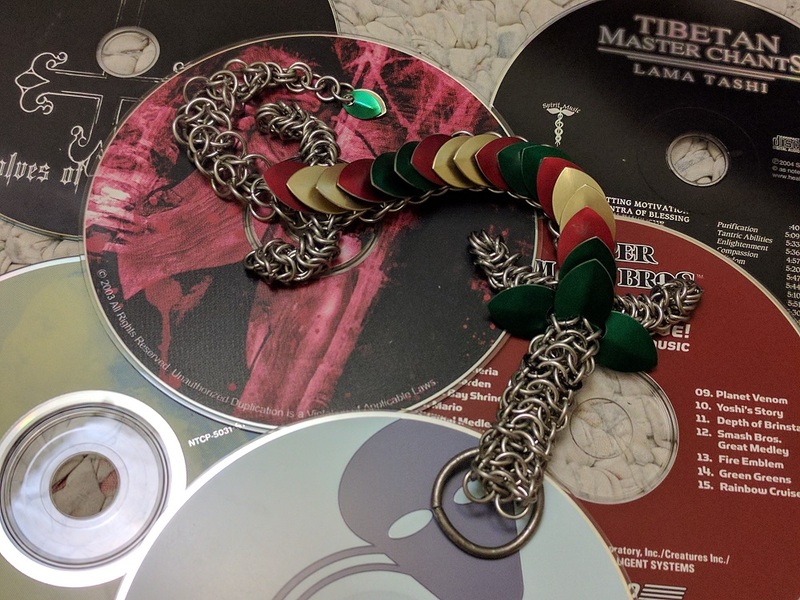 She keeps old computer manuals around for fun, and enjoys browsing tech sites to learn about the newest hardware. Whether it's catching up on the newest programming languages or wiring her own circuit boards, she spends her spare time indulging in her passion. 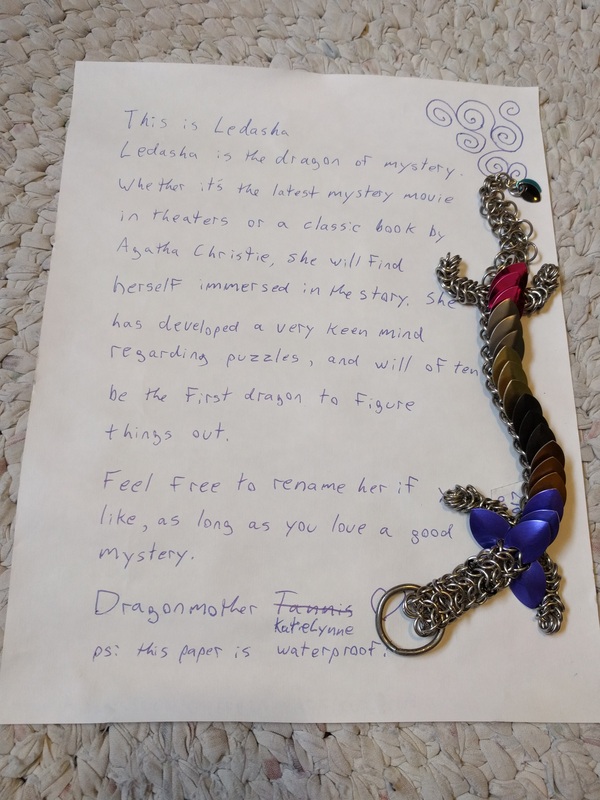 Ledasha is the dragon of mystery. Whether it's a classic book by Agatha Christie or the latest mystery movie in theatres, she will find herself immersed in the story. 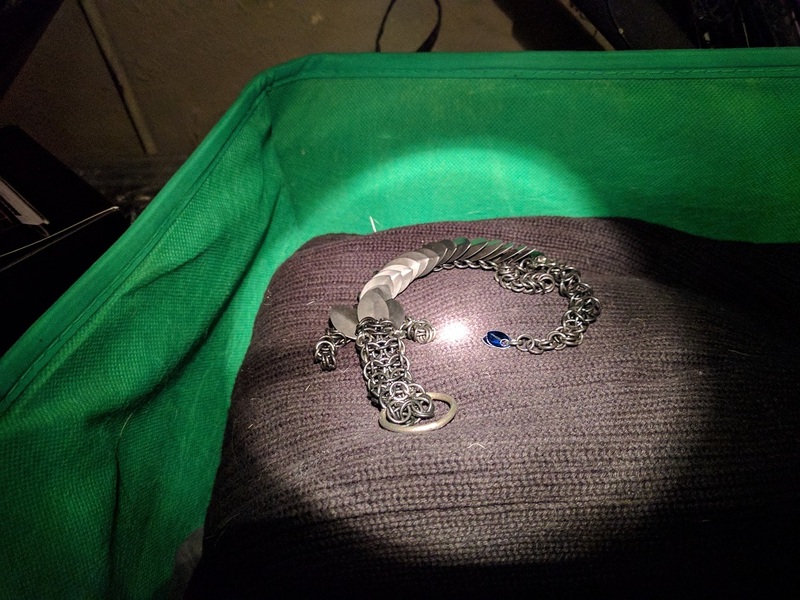 She loves Escape Rooms, and makes a date with friends when a new variation pops up in her city. She has developed a very keen mind regarding puzzles, and will often be the first one to figure things out. Hazel is the dragon of spiders. Born with eight eyes and eight legs, she has incredible vision and can move at terrific speeds. She will often spend time outdoors visiting spiders in their dens and webs to see how they are doing and help them catch insects. Though she cannot spin webs of her own, she uses her speed and vision to keep her home free of flies and other pests. As a natural climber, much of her time is spent in trees, or clinging to the upper corners of rooms. 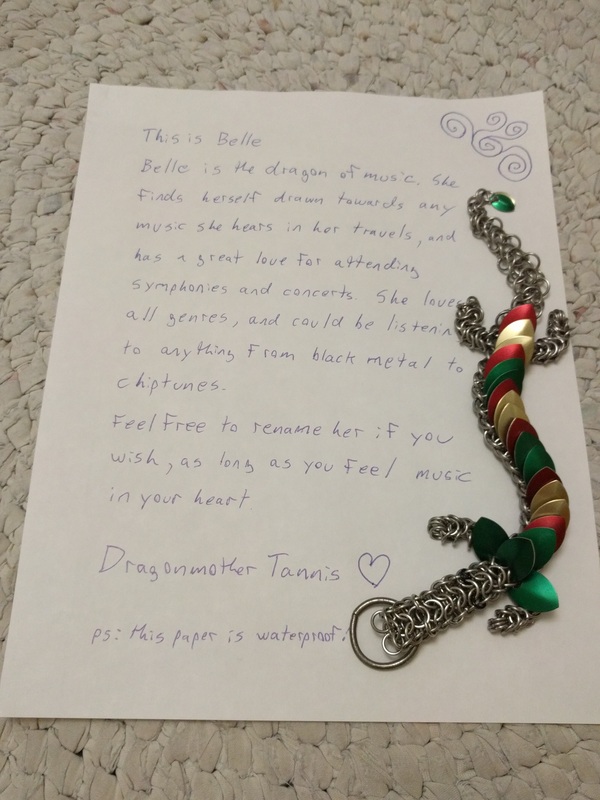 Belle is the dragon of music. She finds herself drawn towards any music that she hears in her travels, and loves attending symphonies and concerts. Loving all genres of music, Belle is just as likely to be listening to modern day pop music as 80's black metal or chiptunes. 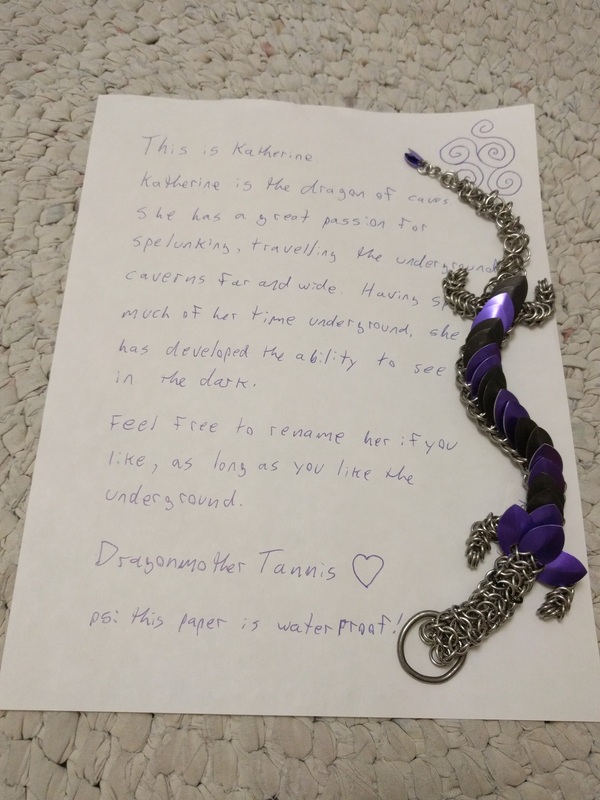 Katherine is the dragon of caves. She has a great passion for spelunking, travelling the underground caverns far and wide. 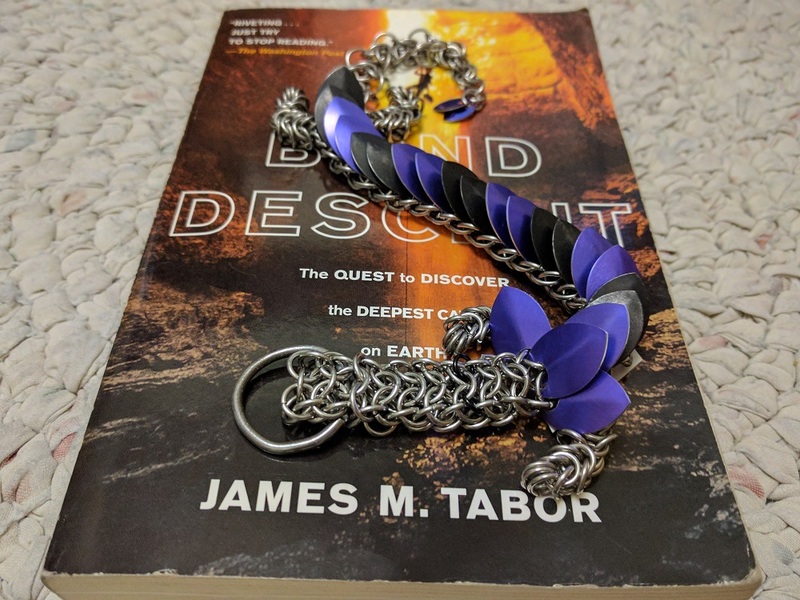 When not actively travelling the inky black depths, she finds herself reading tales of great adventurers who have been discovering the deepest caves on Earth. Having spent much of her time underground, she has developed the ability to see well in the dark. Elisha is the dragon of snakes. She loves slithering into burrows that she finds, greeting the animals inside. She has learned to communicate with the many different species from her visits, and may disappear for hours to enjoy the company of a friendly rabbit or chipmunk. 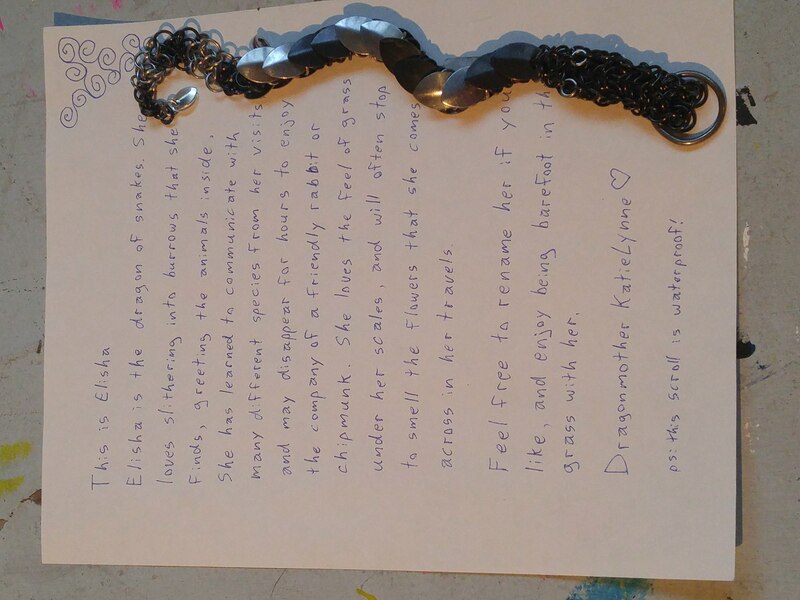 She loves the feel of grass under her scales, and will often stop to smell the flowers that she comes across in her travels. 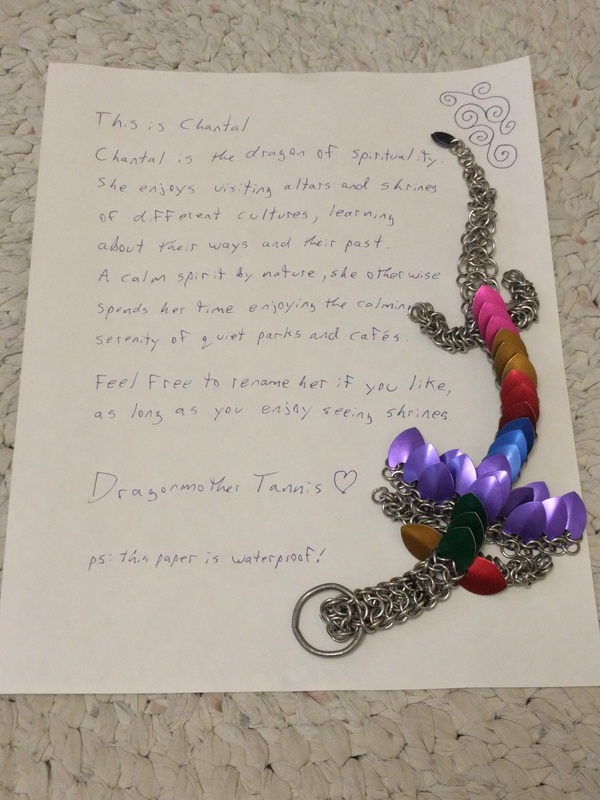 Chantal is the dragon of spirituality. 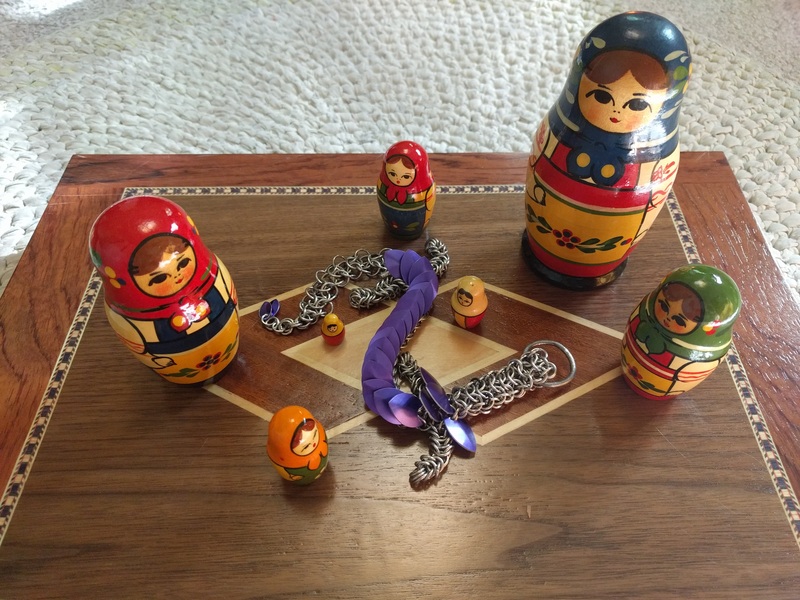 She enjoys visiting altars and shrines of different cultures, learning about their ways and their past. A visitor of many shrines, she has prayed to many Gods, and has come to see many religions as worthy of her time and devotion. A calm spirit by nature, she otherwise spends her time enjoying the calming serenity of quiet parks and cafés. Olga is the dragon of produce. She loves cooking with fresh fruits and vegetables, preparing foods from scratch. She loves cooking for others, and enjoys spending days outside at the local U-Pick gathering strawberries. After returning, you can be sure that she will spend the evening using those berries to bake the freshest strawberry pie that you've ever eaten. 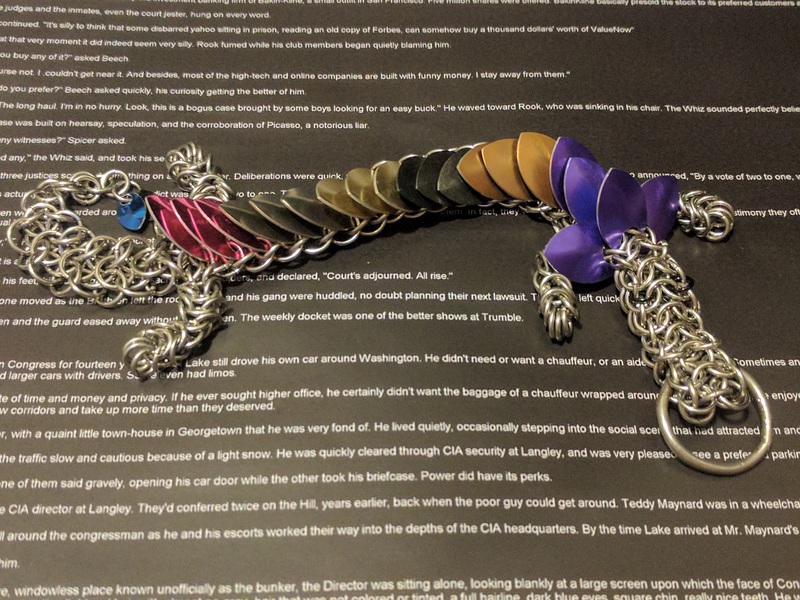 This is Spectrum, dragon of order. 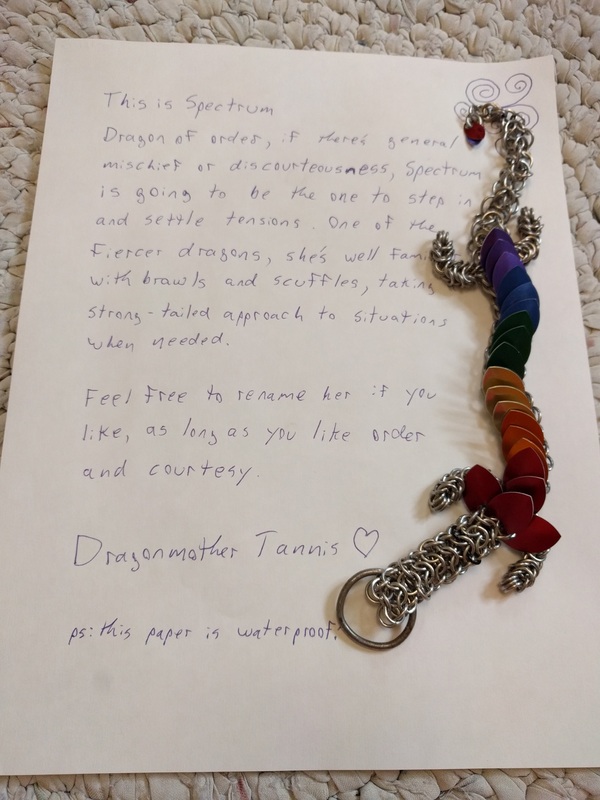 If there general mischief or discourteousness happening, Spectrum is going to be the one to step in and settle tensions or otherwise see what she can do. One of the fiercer dragons, she is well familiar with brawls and scuffles, taking a strong-tailed approach to situations when needed. 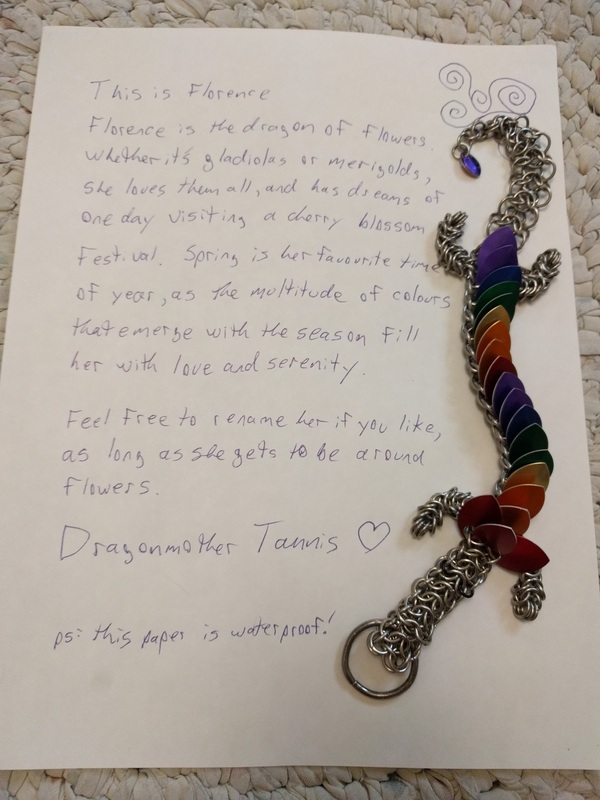 Florence is the dragon of flowers. Whether it's gladiolas or merigolds, Florence is a fan of them all. She has dreams of one day visiting a cherry blossom festival. Spring is her favourite time of year, as that's when all of the flowers are planted and grown, and the multitude of colours that emerge with the season fills her with love and serenity. 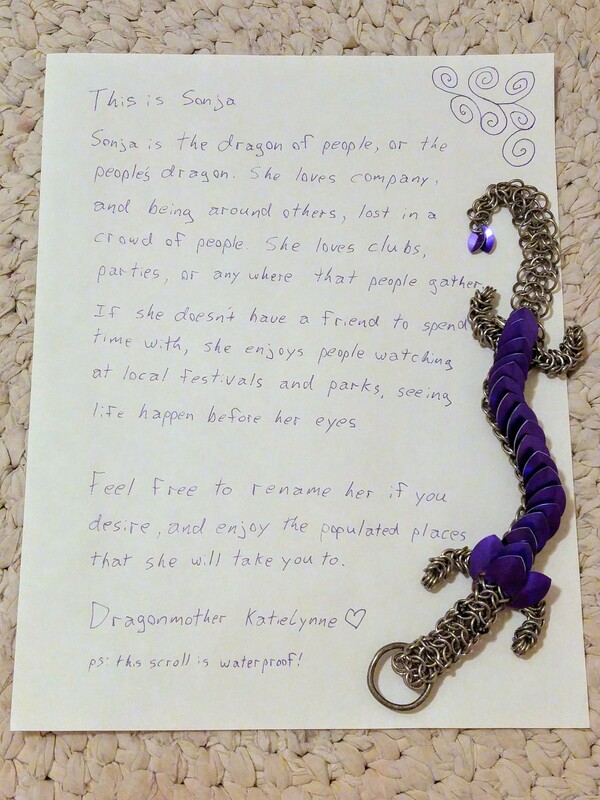 Sonja is the dragon of the people, or the people's dragon. Sonja loves company, and being around others. Malls bustling with people or packed affairs with mingling and merriment, Sonja loves to be lost somewhere inside. Seeing new faces, meeting new people, faces and voices and people in all directions, this is Sonja's favourite sight. When opportunity to gather with others isn't available, Sonja enjoys people-watching at local festivals or parks, enjoying the atmosphere and watching life happen before her eyes. 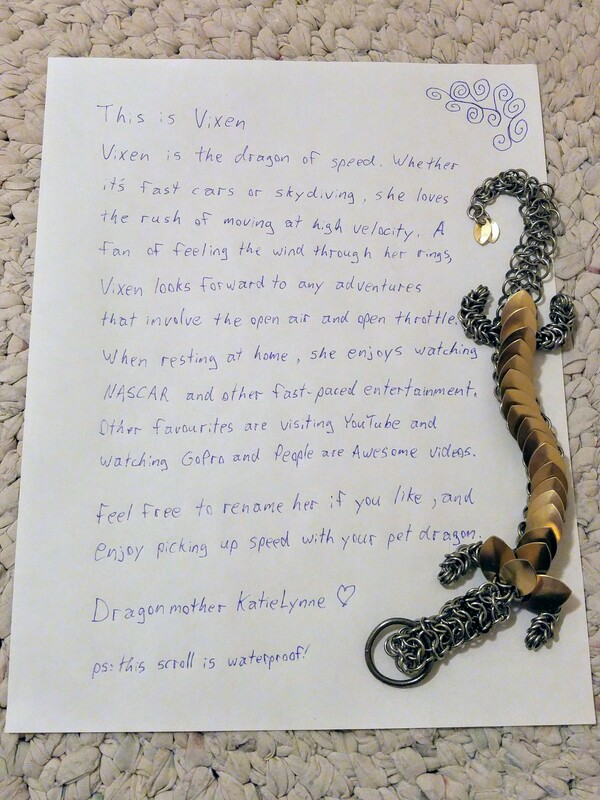 This is Vixen, dragon of speed. Whether it's fast cars, bungee jumping or skydiving, she loves the rush of moving at high velocity. A fan of feeling the wind through her rings, Vixen looks forward to any adventures that involve the open air and open throttle. When resting at home, she enjoys watching NASCAR and other fast-paced entertainment. Other favourites are visiting YouTube and watching GoPro and People are Awesome videos. 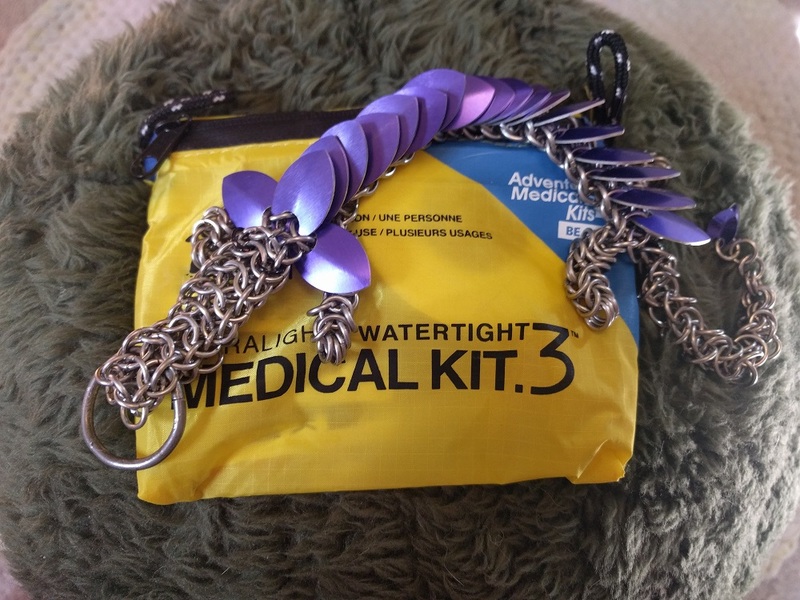 Sissy is the dragon of meticulosity. She adores the precise, and loves arranging delicate figurines on shelves and in display cabinets. She loves a clean home and enjoys dusting, often re-arranging the figurines with each cleaning. Even while shopping, she will take the time to better fold clothing in stores or re-arrange canned goods to have their labels facing forwards. Cleaning until spotlessness and organized chaos, that's what Sissy loves most. Fun fact: Sissy was named after the cutest little kitten at a cat shelter where I've volunteered, Craig Street Cats. 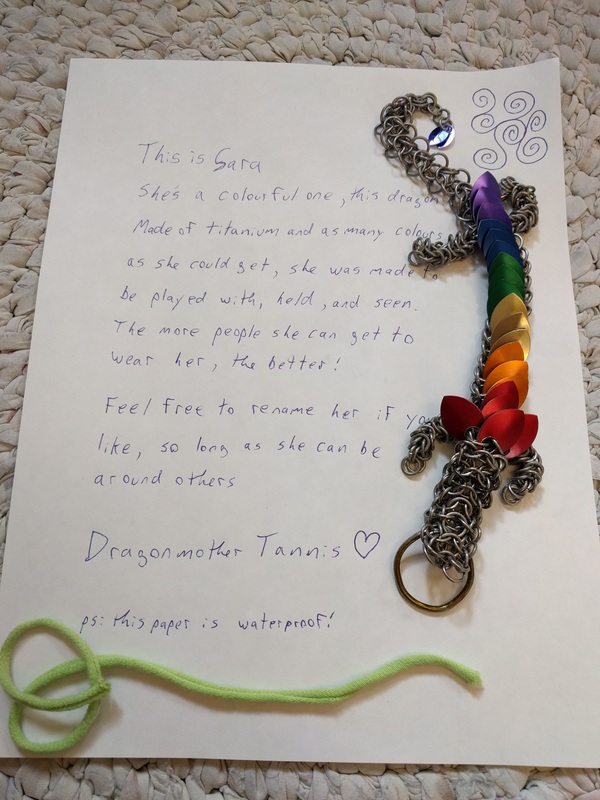 Sissy (the cat) wasn't pink, but she came to mind while this cute little dragon was being made. 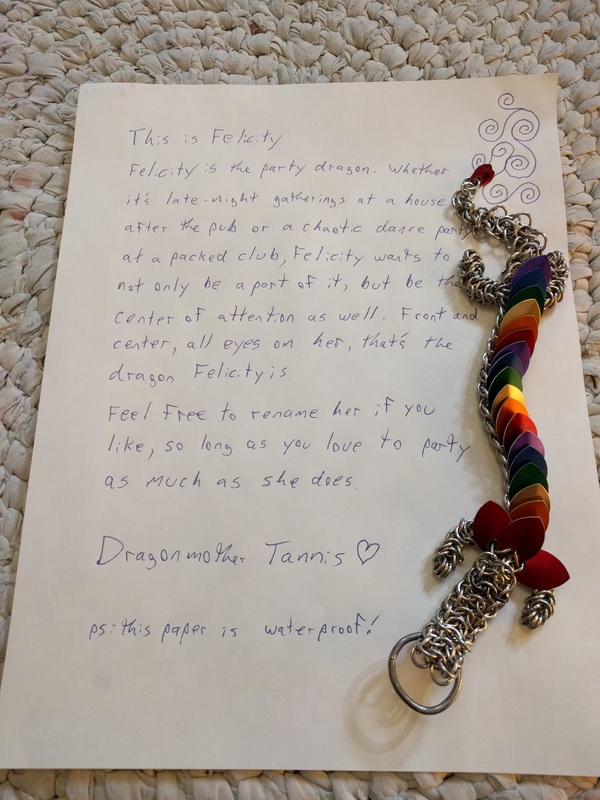 Felicity is the party dragon. If there's music playing and dancing to be had, Felicity will be there. Whether it's late-night gatherings at a friend's house after the pub or a chaotic dance party at a packed club, Felicity not only wants to be a part of it, but be the center of attention as well. Front and center, all eyes on her, that's the dragon Felicity is. 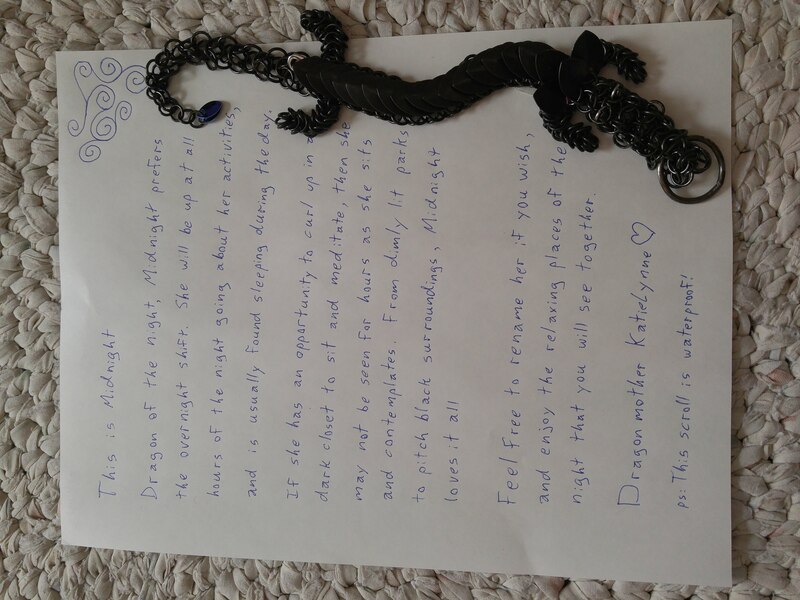 Dragon of the night, Midnight prefers the overnight shift. She will be up at all hours of the night going about her activities, and is usually found sleeping during the day. If she has an opportunity to curl up in a dark closet to sit and meditate, then she may not be seen for hours as she sits and contemplates. From dimly lit parks to pitch black surroundings, Midnight loves it all. Her birthday has changed from the original May 09, 2017. 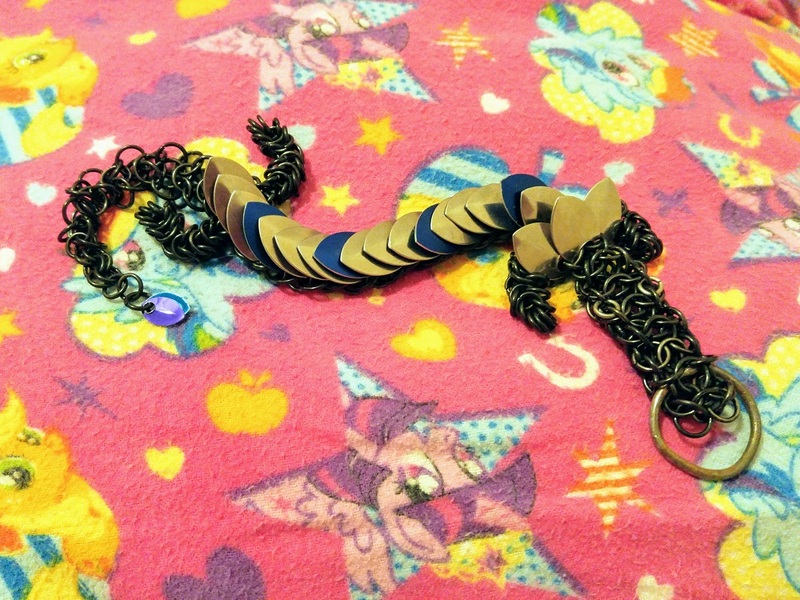 During a tight time period where I needed to have another black dragon finished more or less immediately for a customer, Midnight offered to give up her head, arms, and tail to finish the new dragon (Erica). Midnight was rebuilt, giving her a new birthday on March 14, 2018. She still spoke to me during that time though, and was sad until she was finally completed. 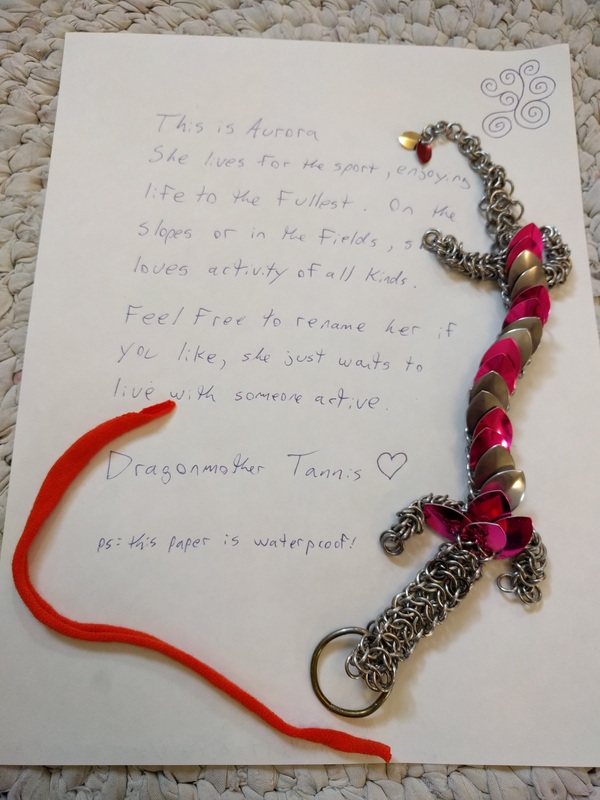 She was also converted to the new style of dragon body using an interwoven 4-1 weave rather than the Persian Dragonscale that I had been using at the time. All of the same rings for the body were used to change her weave. 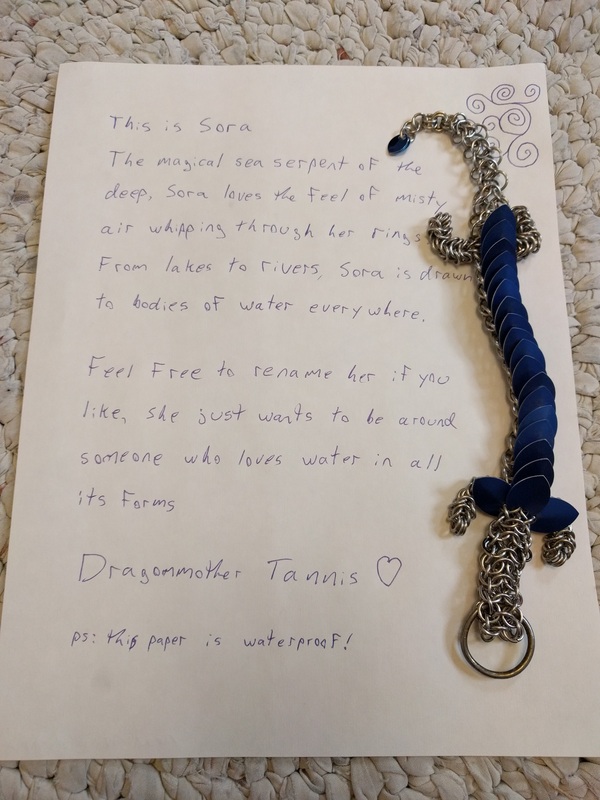 This is Sora, the magical sea serpent of the deep. 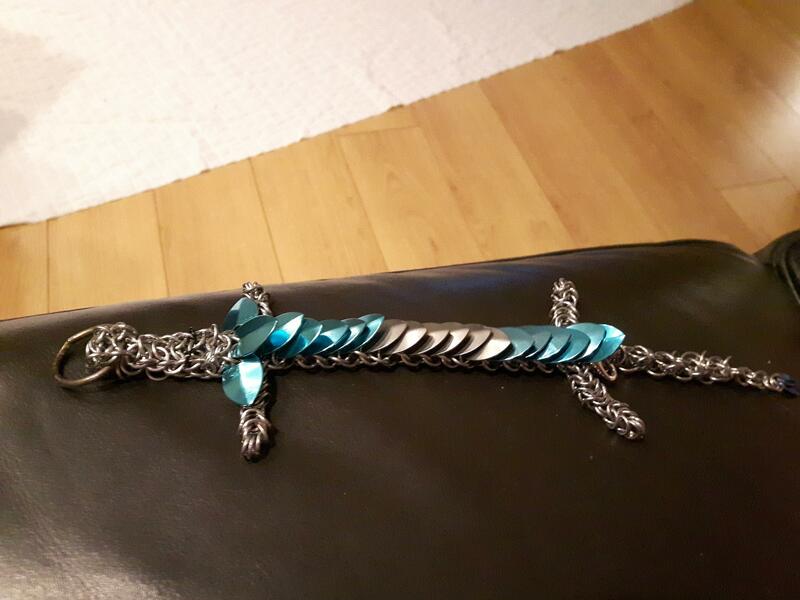 Wanting to make a blue dragon next, Sora called from the seas to be the next dragon made. She loves the feel of misty air whipping through her rings as she glides through the sea spray. From lakes to rivers, Sora is drawn to bodies of water everywhere. If there's an opportunity for her to sail the open seas, that's where she'll be found. 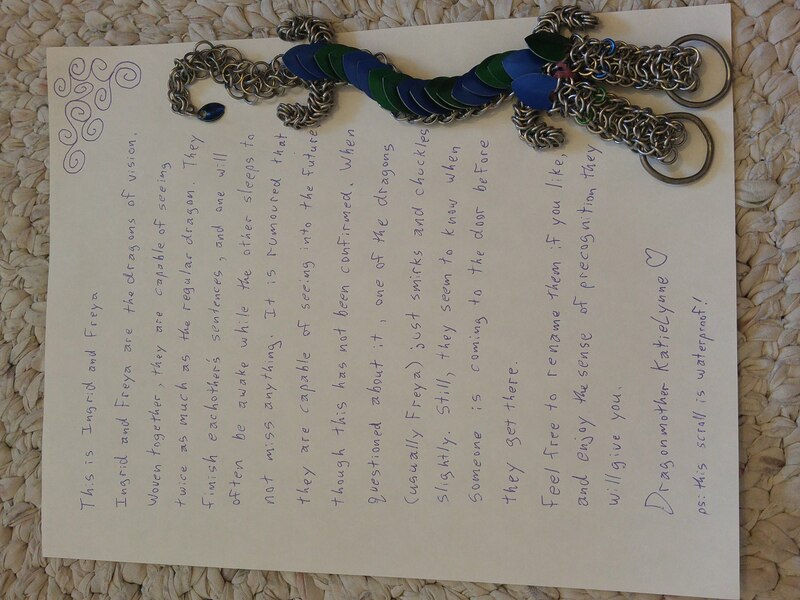 Ingrid and Freya are the dragons of vision. 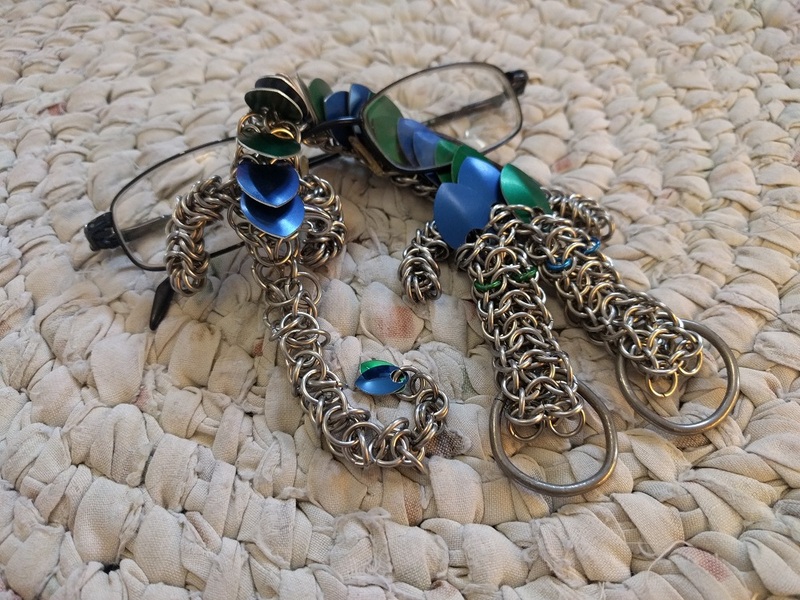 Woven together, they are capable of seeing twice as much as the regular dragon. They finish eachothers sentences, and one will often be awake while the other sleeps to not miss anything. It is rumoured that they are capable of seeing into the future, though this has not been confirmed. 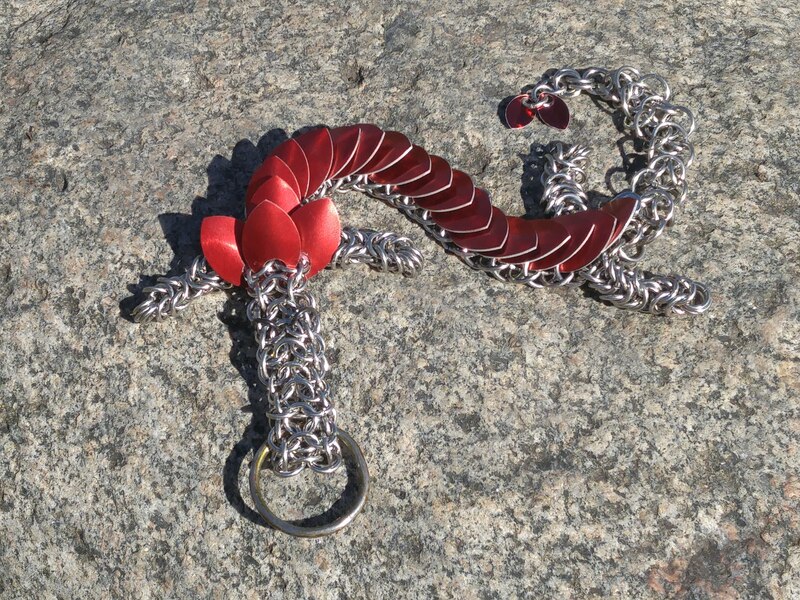 When questioned about it, one of the dragons (usually Freya) just smirks and chuckles slightly. Still, they seem to know when someone is coming to the door before they get there. 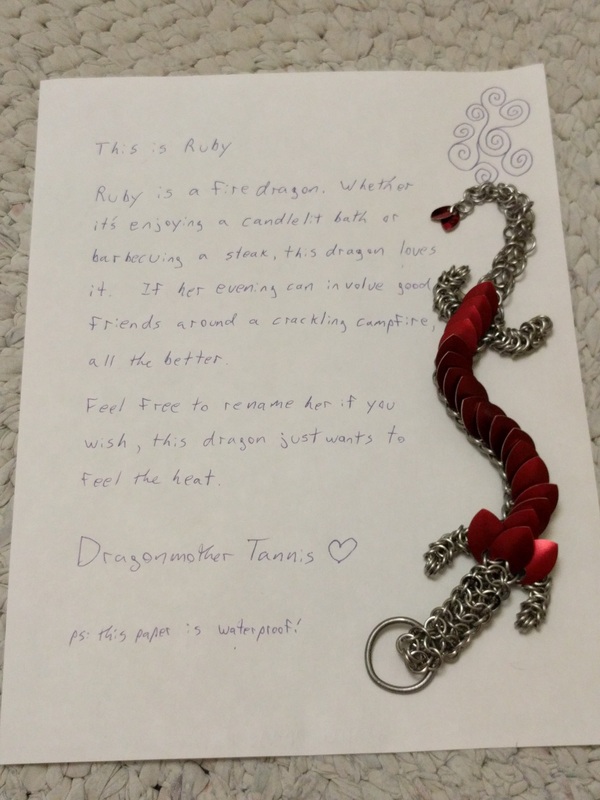 Ruby asked to be made red, knowing that she is a fire dragon from the start. 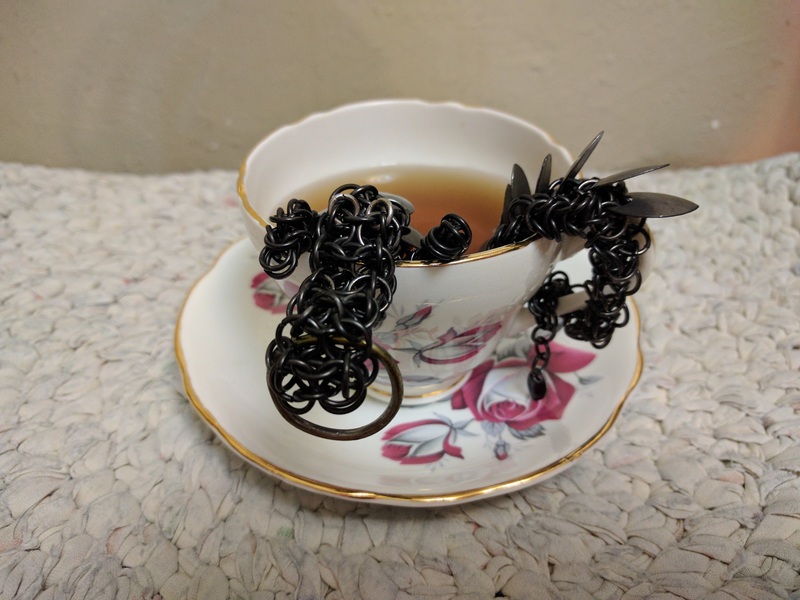 Whether it's enjoying a candlelit bath or barbecuing a steak, this dragon loves it. If her evening can involve good friends around a crackling campfire, all the better. 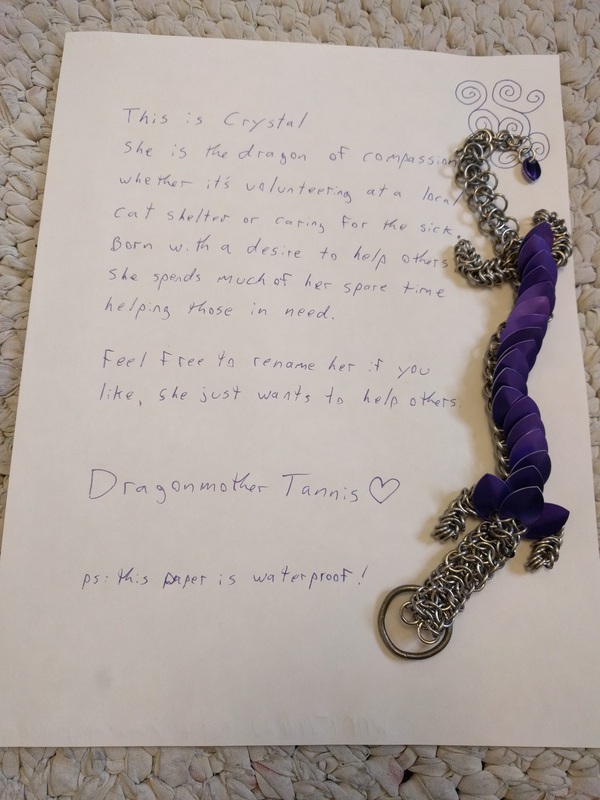 Crystal is the dragon of compassion. Whether it's volunteering at a local cat shelter or caring for the sick, she wants to be involved. Born with a desire to help others, she spends much of her spare time helping those in need. In-tune with the medical world, she finds herself drawn to documentaries or other dramas featuring such subjects. 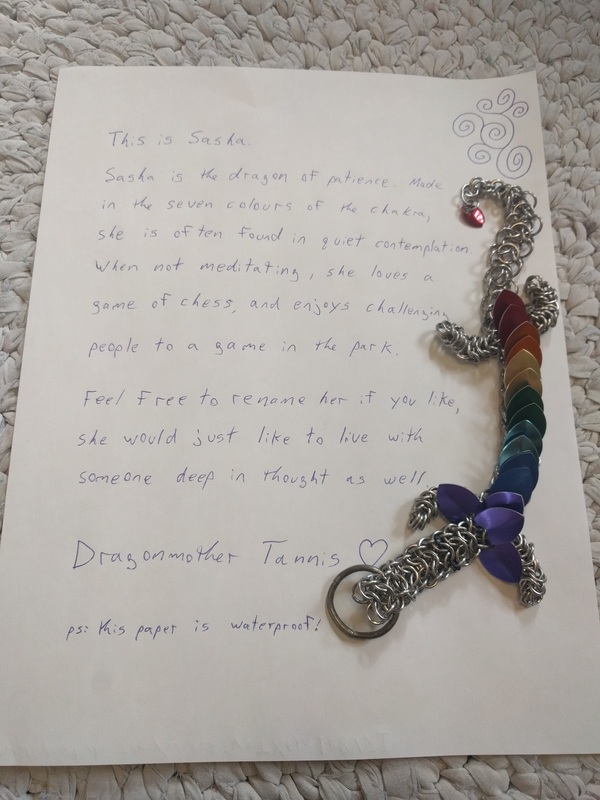 Sasha is the dragon of patience. Made in the seven colours of the chakra, she is often found in quiet contemplation. 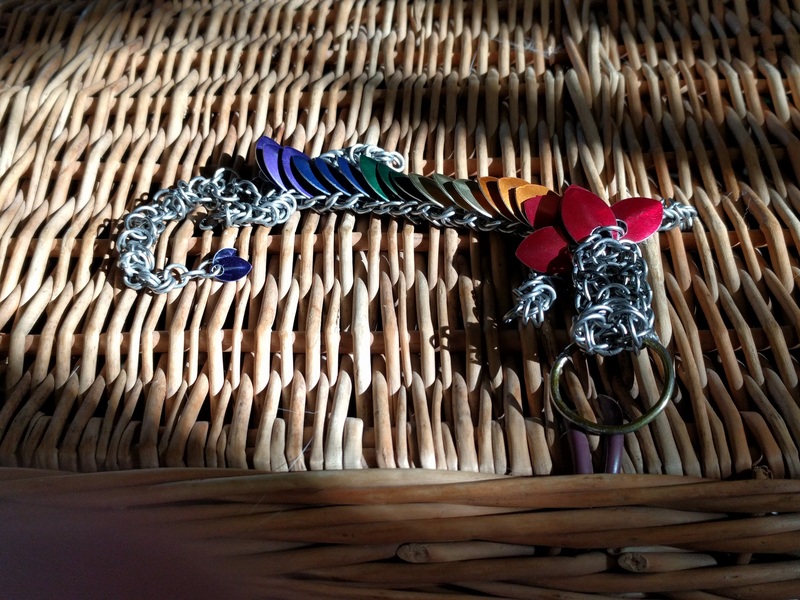 Sasha is a bit shorter of a dragon than the rest of her sisters, using fourteen scales down her back to make the seven colours rather than the usual 18. When not meditating, she can be found playing chess, go, or other similar games. 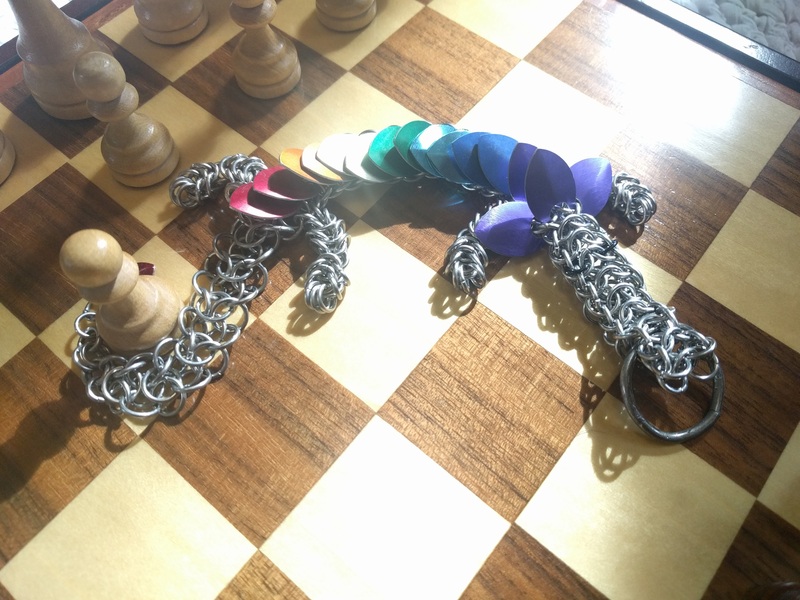 When she gets the chance, she loves setting up an outdoor chess board at a park and seeing if any passers-by are willing to challenge her to a game. 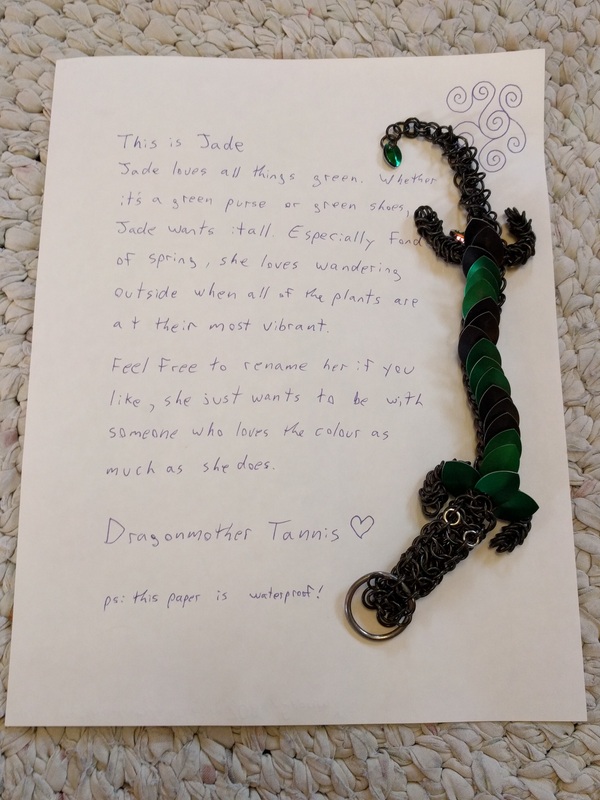 Jade loves all things green. Named for her likeness to the mineral, Jade just has a fondness for the colour in all its forms. Whether it's a green purse, green shoes, or green trees, Jade loves it all. No shade too dark, no shade too light, she's drawn to the colour where she can find it. Especially fond of spring, she loves wandering outside when all of the plants are at their most vibrant. 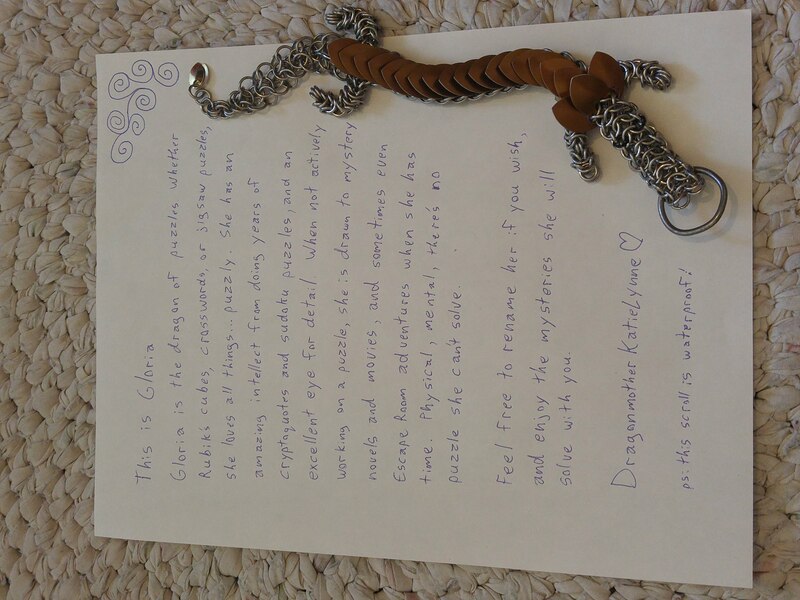 Gloria is the dragon of puzzles. 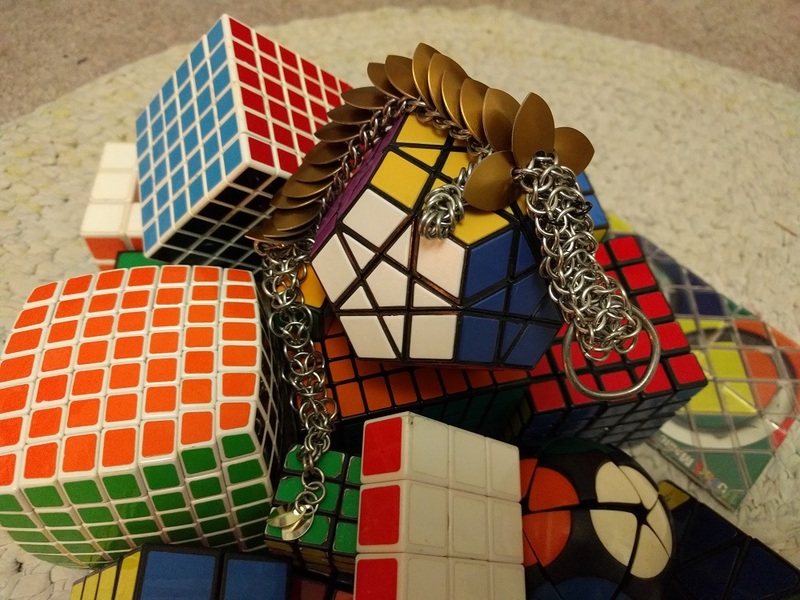 Whether Rubik's cubes, crosswords, or jigsaw puzzles, she loves all things... puzzly. She has an amazing intellect from doing years of cryptoquotes and sudoku puzzles, and and excellent eye for detail. 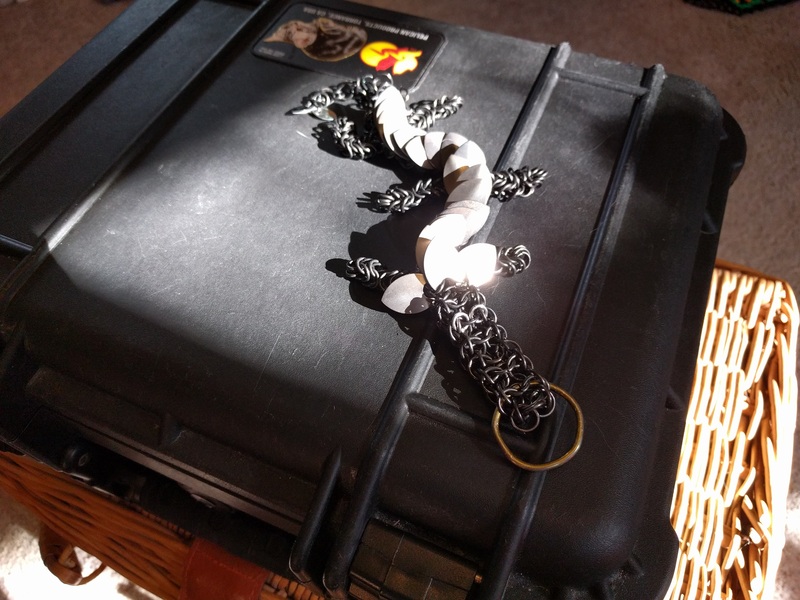 When not actively working on a puzzle, she is drawn to mystery novels and movies, and sometimes even Escape Room adventures when she has time. Physical, mental, there's no puzzle she can't solve. 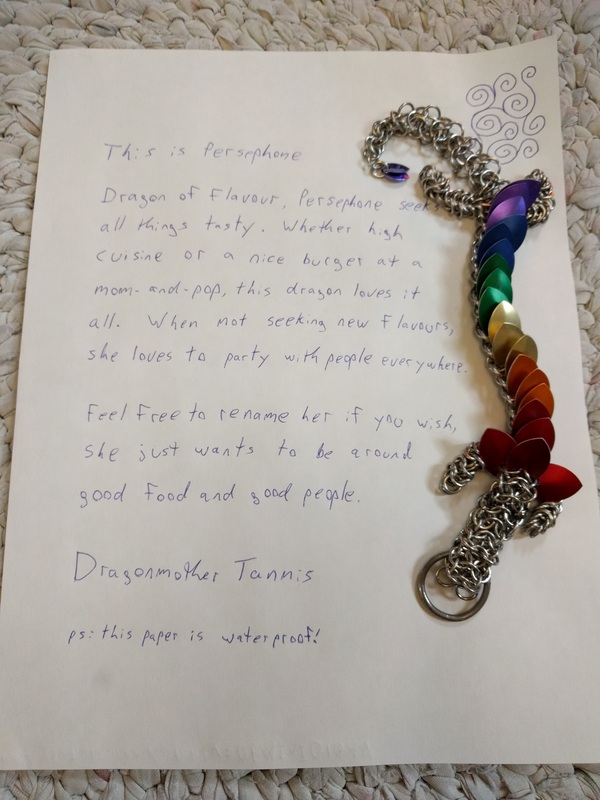 Dragon of flavour, Persephone seeks all things tasty. 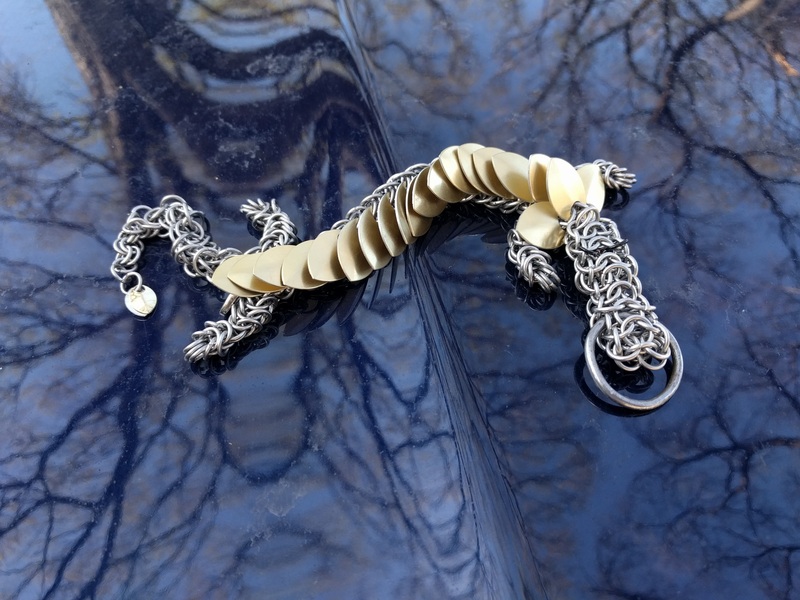 Whether it's haute cuisine at a fancy restaurant or a good old greasy burger at a mom-and-pop, this dragon loves it all. 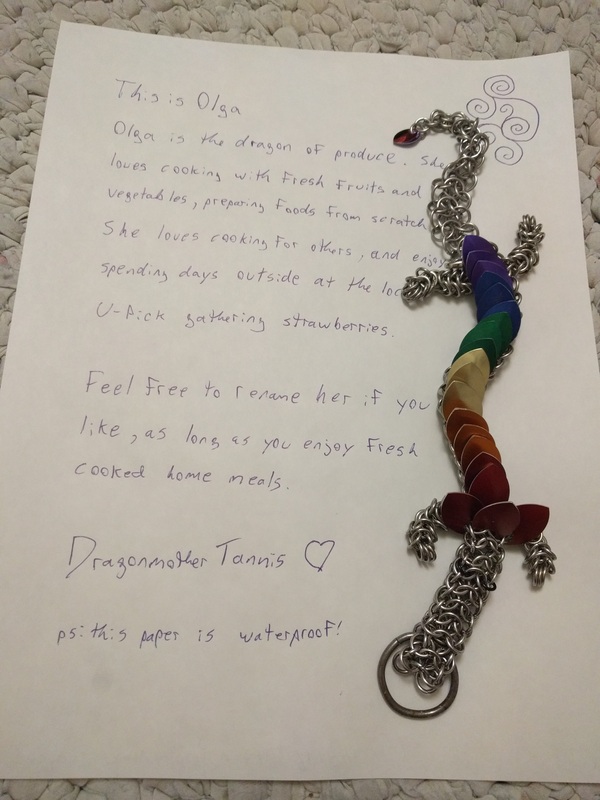 Never one to turn down an offer to try something new, this dragon loves her food and the people who make it. When not seeking new flavours, she loves to party with people everywhere. Sunset loves the beach and the sand. If there's surf, she wants to play in it. If there's a hot rock baking in the sun, she wants to bask on it. 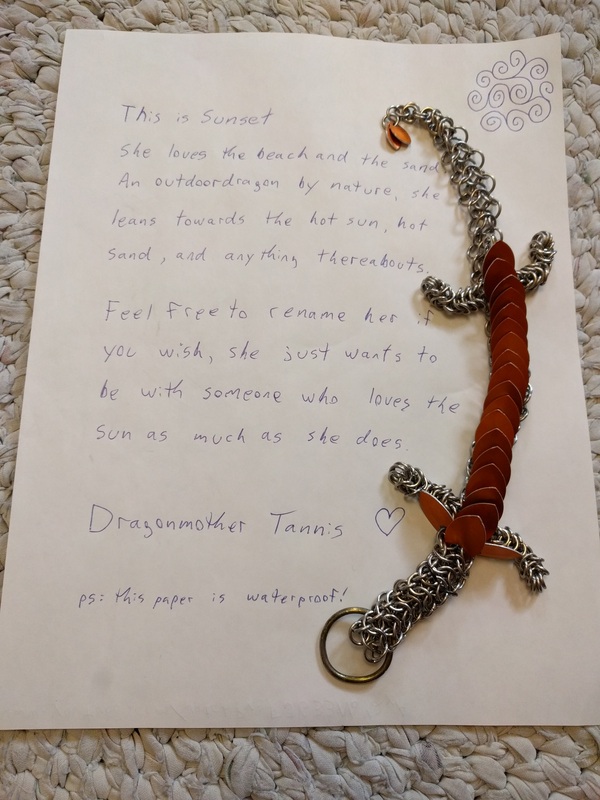 An outdoordragon by nature, she leans more towards the hot sun, hot sand, and anything thereabouts. If there's an opportunity for her to get out to watch the actual sunset over a calm lake, then that's exactly what this dragon is going to do. Added bonus if her and her companions have built a sand castle for her to roost upon! 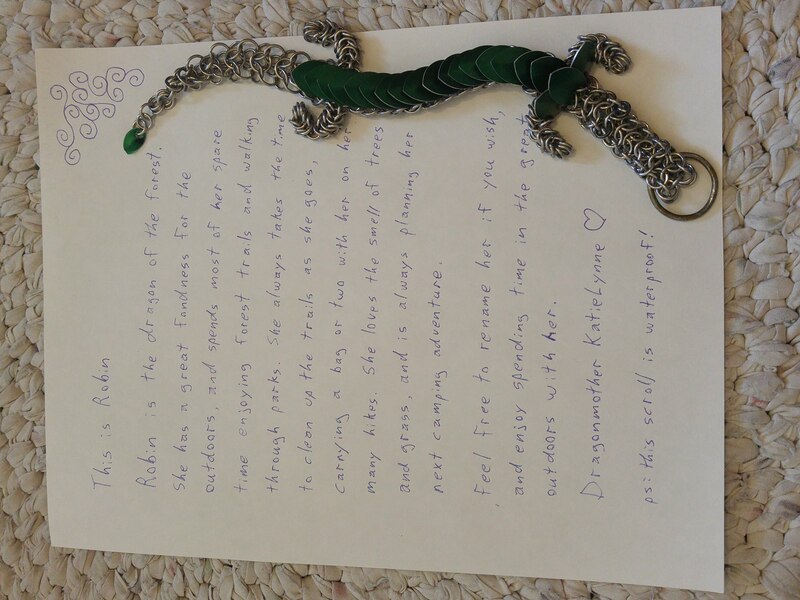 Robin is the dragon of the forest. She has a great fondness for the outdoors, and spends most of her spare time enjoying forest trails and walking through parks. She always takes the time to clean up the trails as she goes, carrying a bag or two with her on her many hikes. She loves the smell of trees and grass, and is always planning her next camping adventure. 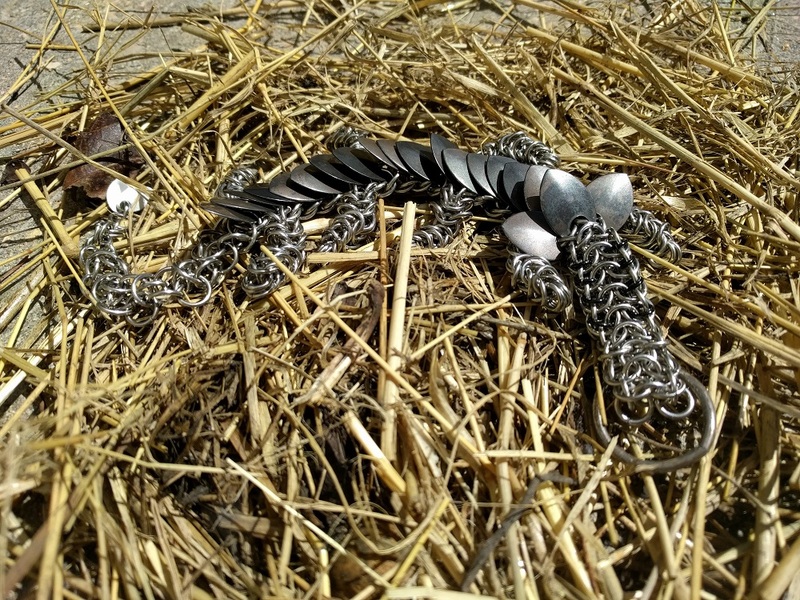 Sapphyre (formerly Lagertha) is a defender of the skies and of her companion. She wanted to be built for speed, and so asked if she could have two tails. Having no problems with the concept, I struggled with the connections for the tail for quite a while before it came into being. 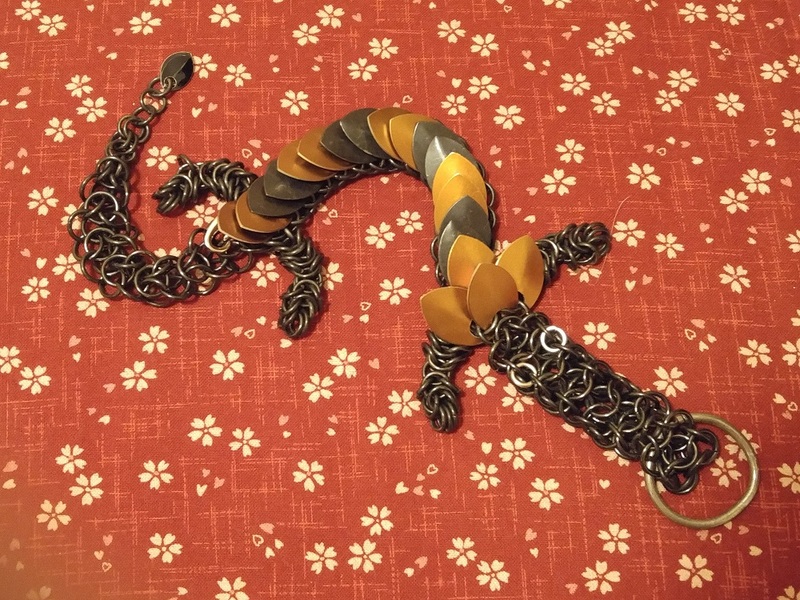 She's additionally unique in that she can be turned into a bracelet while still having a tail free to swing around if desired. 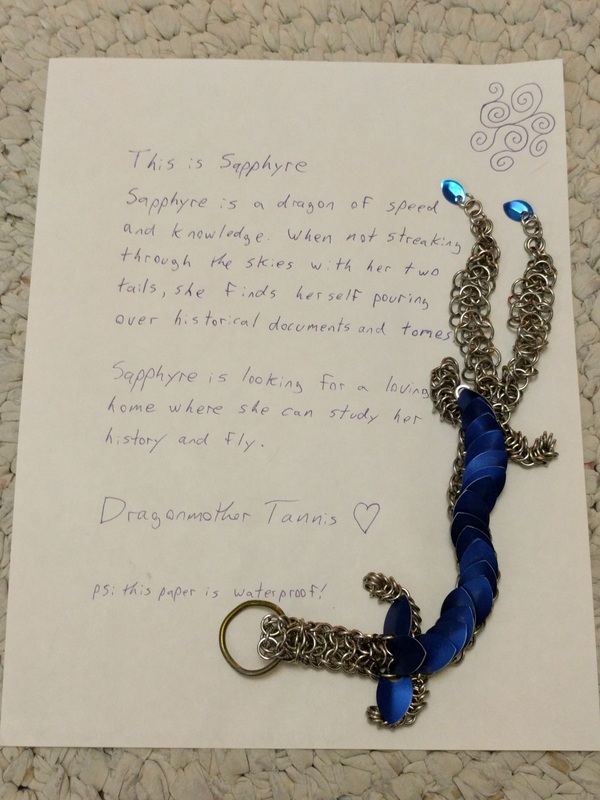 Sapphyre is the dragon of speed and knowledge. When not streaking through the skies with her two tails, she finds herself pouring over historical documents and tomes. 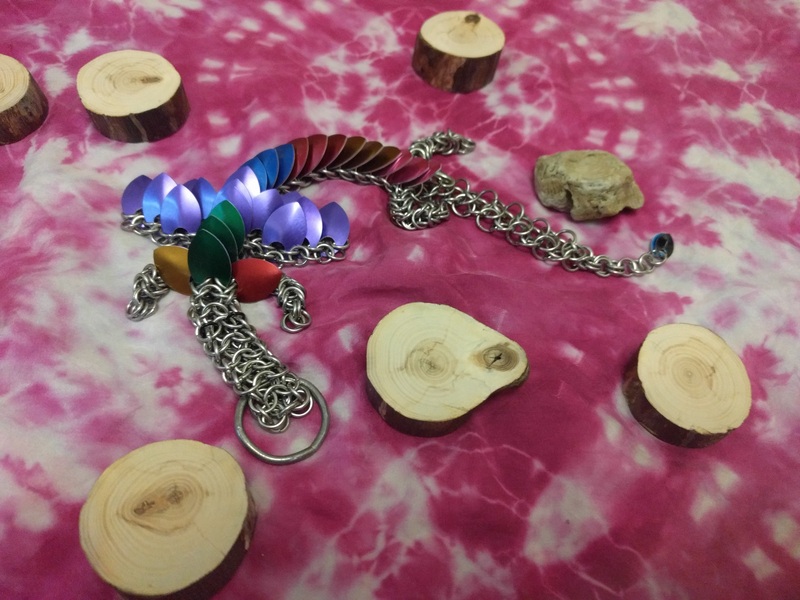 She's a colourful one, this dragon. 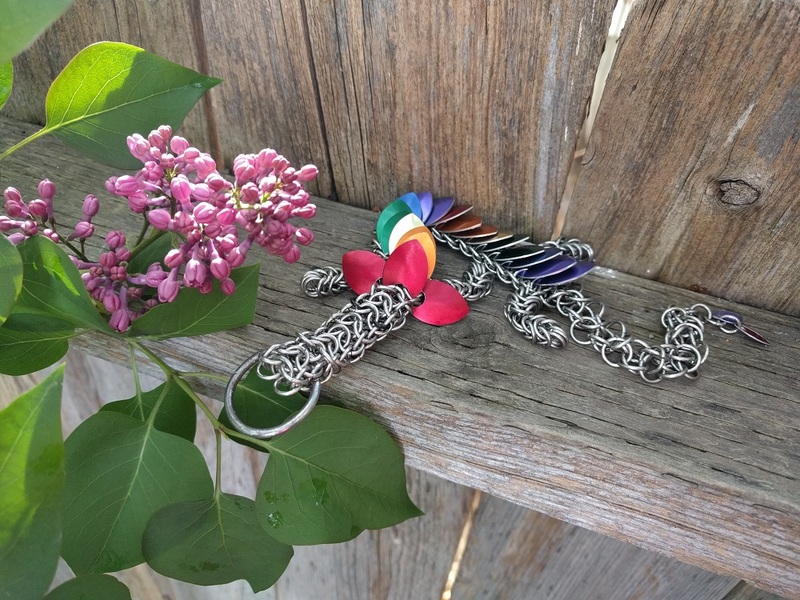 Made of titanium and the colours of the rainbow, she was made to be played with, held, and seen. 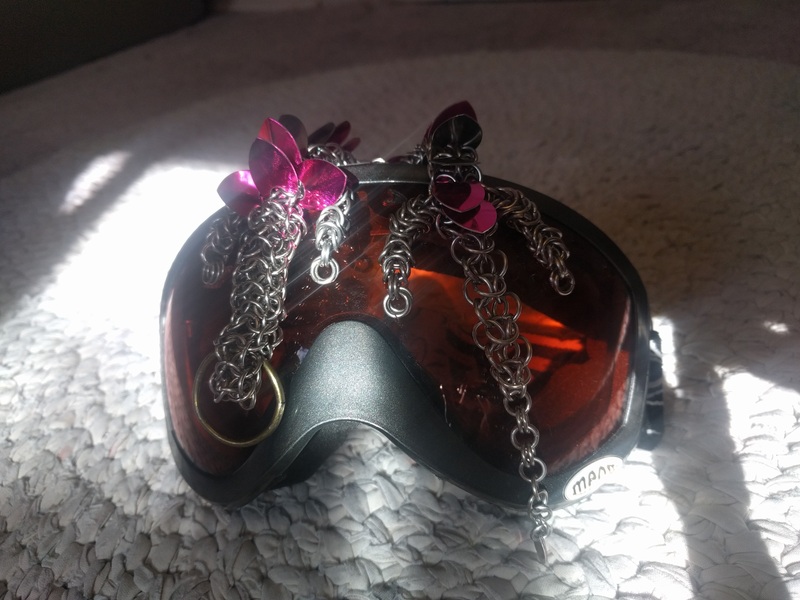 The more people she can get to wear her, the better! She was gifted to Sunshine House where Drag-On Queen took up residence. With Queen off on an adventure, Sara stepped in to take her place. 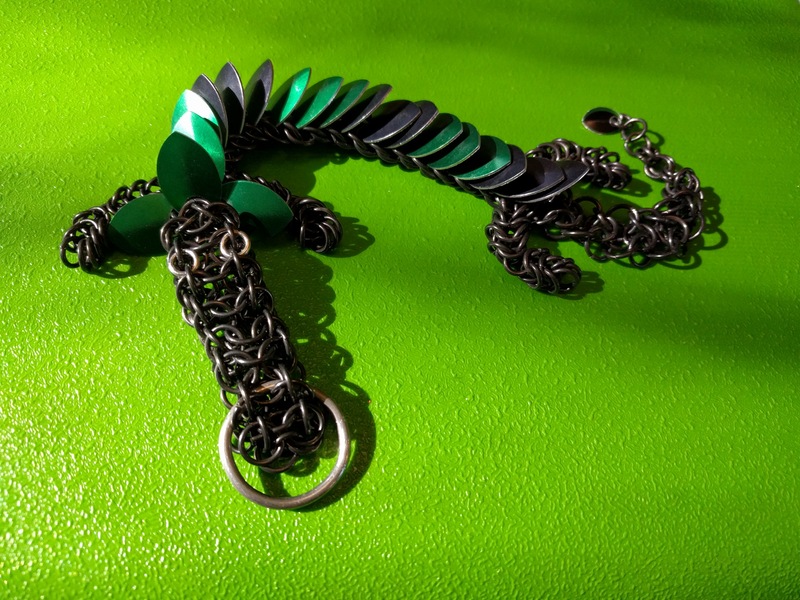 She is the lightest dragon made so far being mostly titanium, and with double the teeth she's extra fierce to go with being extra colourful. Skitters also yearned for life, long before ring was put to scale. I knew she was going to be an unusual one when she asked for six legs. I made sure of it a few times throughout, but she was adamant. She wanted to skitter, and the best way to skitter was with more legs. So hey, who am I to deny a dragon her preferred number of legs. 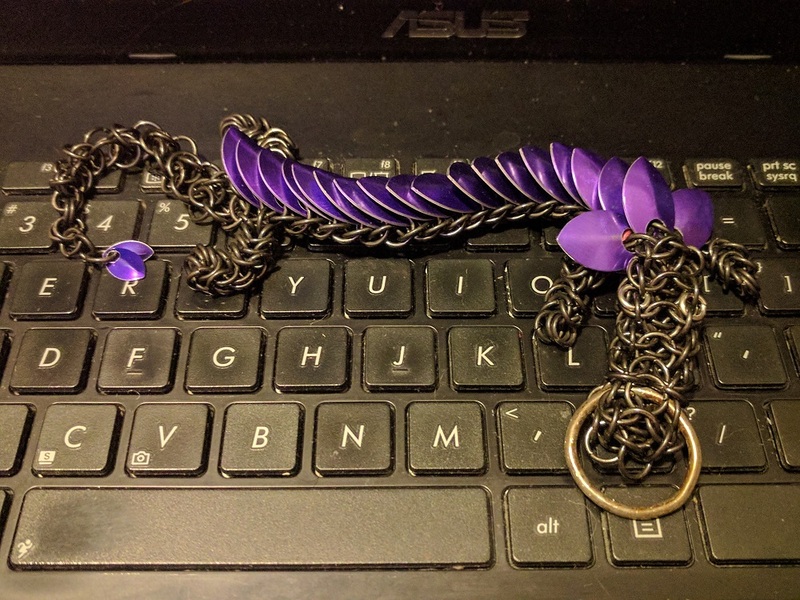 And so, with the similar problem as Aurora of limited rings, she was created as far as she could go until the next chainmaille order arrived, wherein she would be completed. Like Aurora, she wanted to be striped as well but with a little extra power, so she chose a titanium/tempered high-carbon steel scale pattern. Skitters is a feisty one. When not darting about left and right, she loves to lay down in front of you and watch what you're doing. Aurora sought to be born from the remainders of the last of the shiny pink and aged stainless scales. 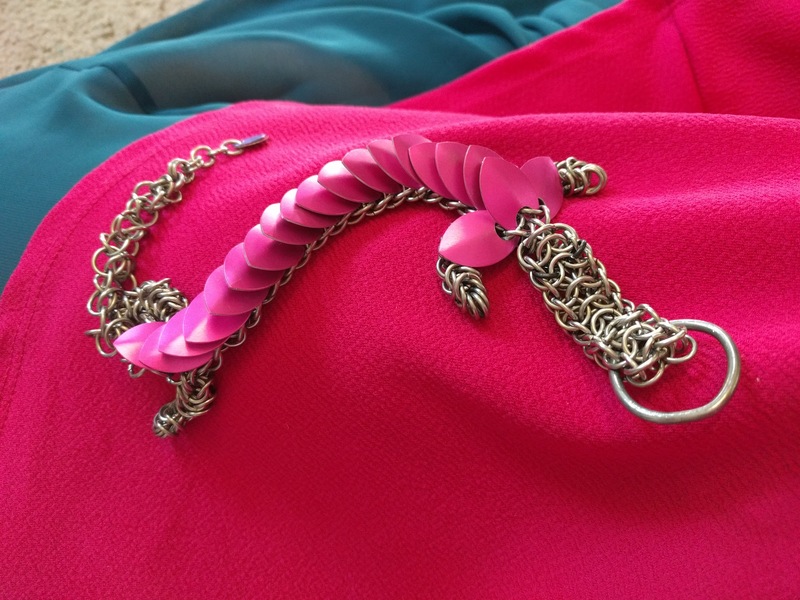 She wanted to be colourful yet striped, making her our first striped dragon, alternating between hot pink and shiny stainless steel. 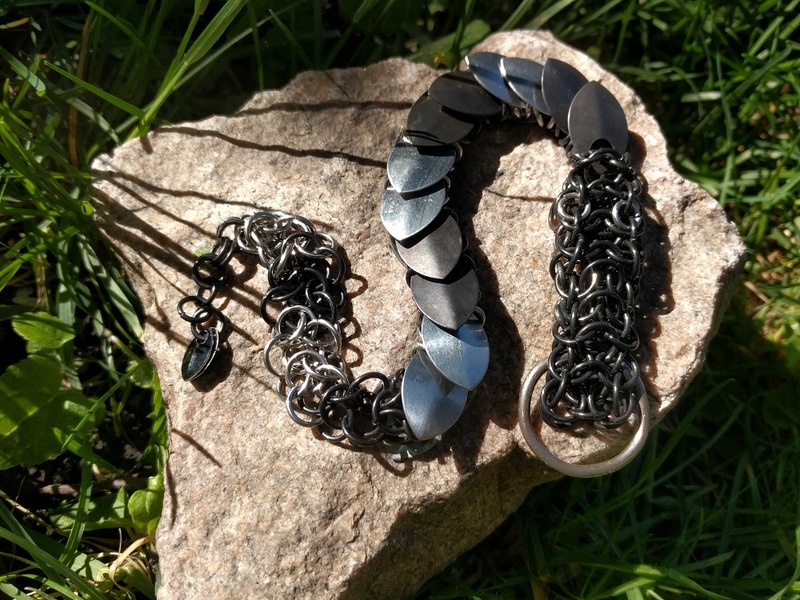 And despite intuitively knowing that there would not be enough rings to finish her before the next chainmaille order, she still asked to be created, as far as she could. And so, she was born half-created with her twin Skitters, falling into a similar, yet different situation. We ended up having enough rings to finish her after all though, having disassembled several half-finished projects to make up the shortage, which led to her having a slimmer, more streamlined tail. After receiving her tail and legs, Aurora vowed to be the dragon of sport, enjoying life to the fullest. On the slopes or in the fields, she loves activity of all kinds. 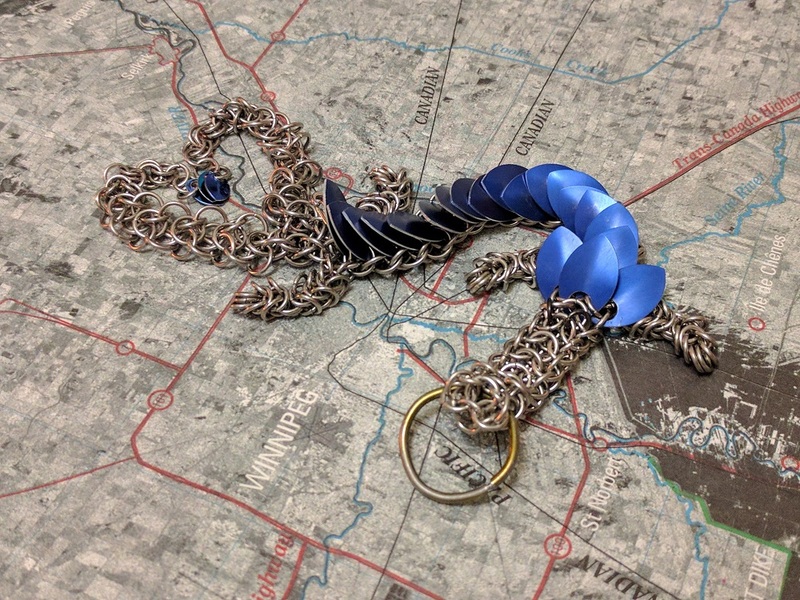 The second of our dragons to be given life. 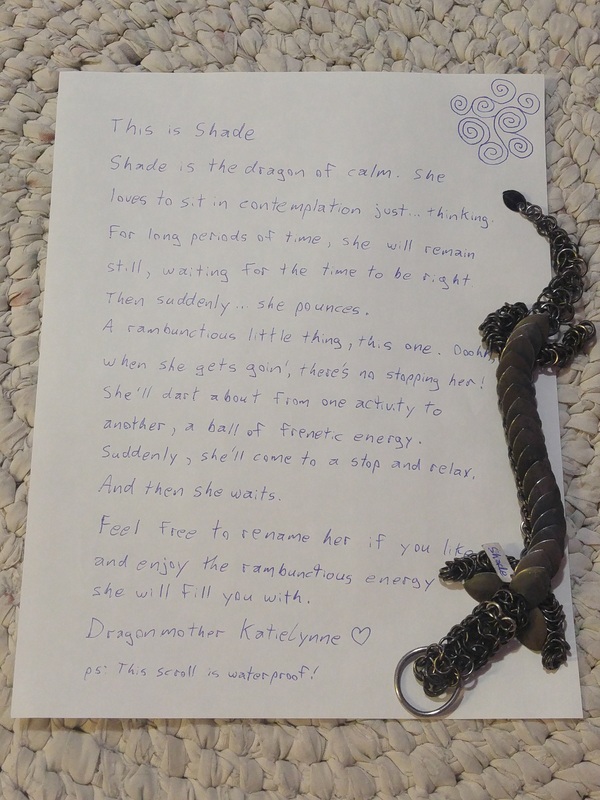 Shade is the dragon of calm. He enjoys the peaceful, like relaxing in the hot sun, or meditating in a comfortable spot. The sound of a gentle breeze and birds chirping are all the music that he needs, and he can sometimes be found resting on a tree branch to be nearer to them. He's not all rest and relaxation though, and will enjoy a fast-paced game of tag, or dart around after the birds and squirrels when he wants some action. 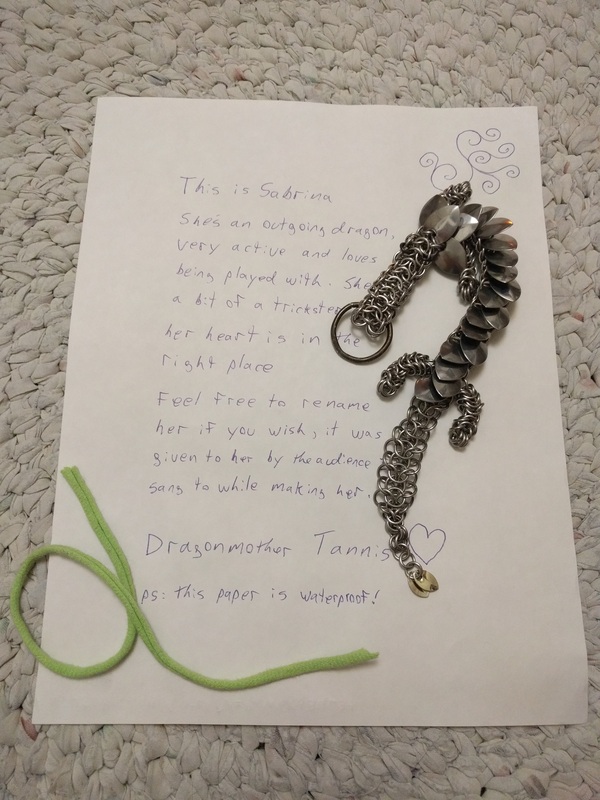 The first of the throng, I wanted to make her the best dragon I possibly could. 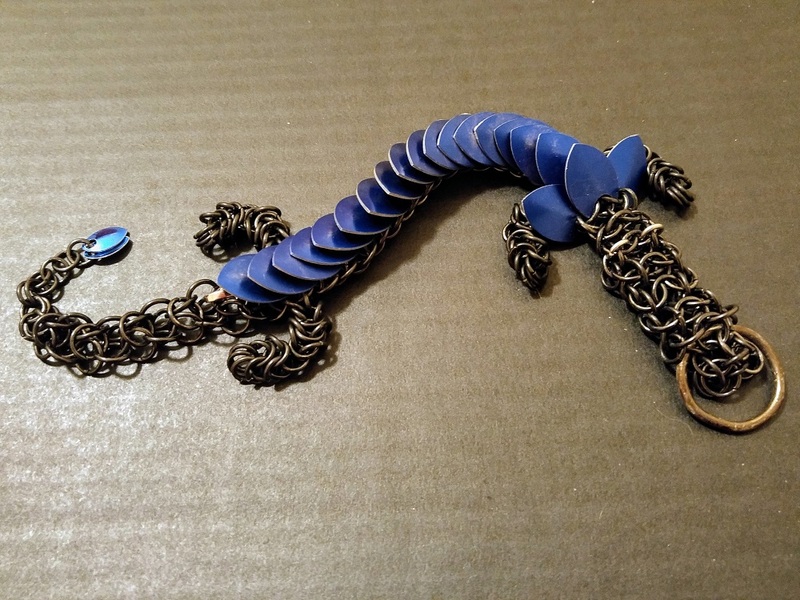 Having had a fair amount of practice making dragons to this point, I've found pretty good ways of running one weave into the next, blending them as best possible. 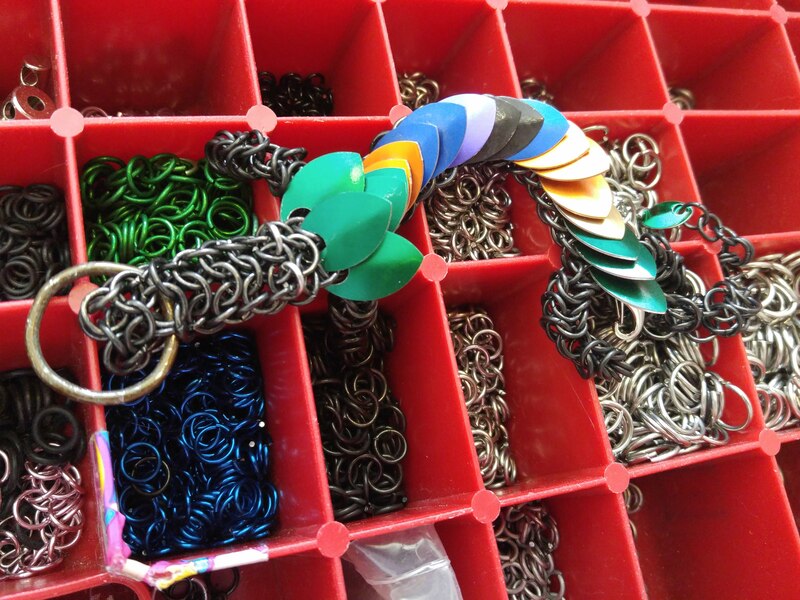 She uses four different sizes of 18 gauge rings, 7/32", 1/4", 3/16", and 5/32", making her all kinds of complicated. 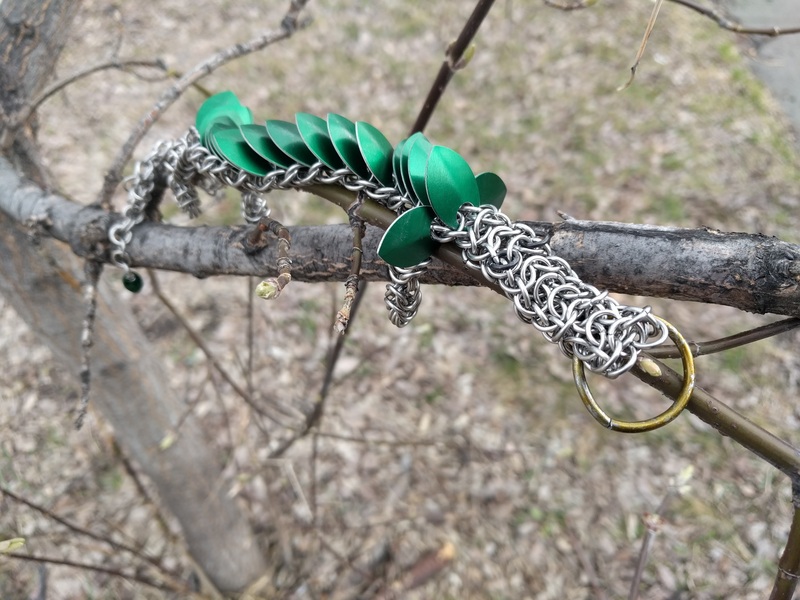 Five sizes if you include the mouth ring, which is 12 gauge enamelled mild steel. She received new adoption papers in 2018, though only her original ones are shown here. She's the dragon of sewing, enjoying making pillows and stuffies for friends and family. 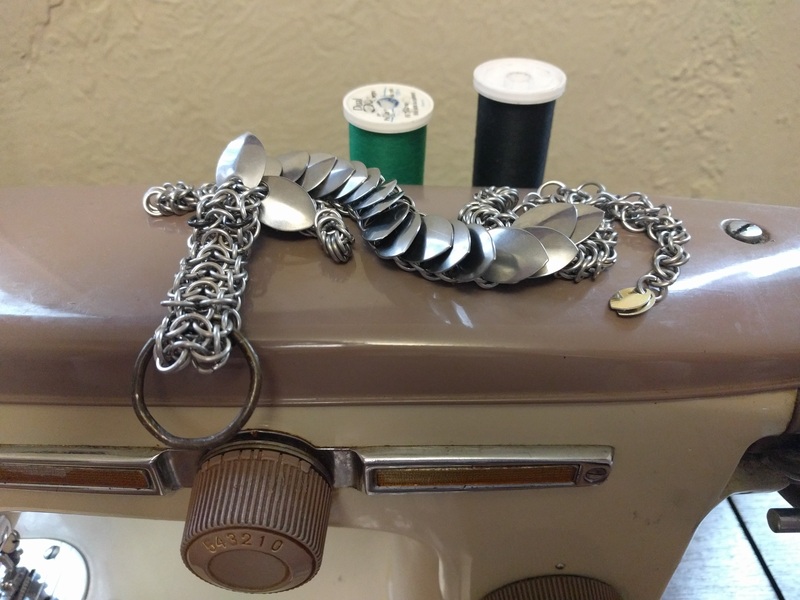 Hand sewing, machine sewing, she loves crafting with cloth. Odds are if you know her, then she has already made you something cute and fuzzy.